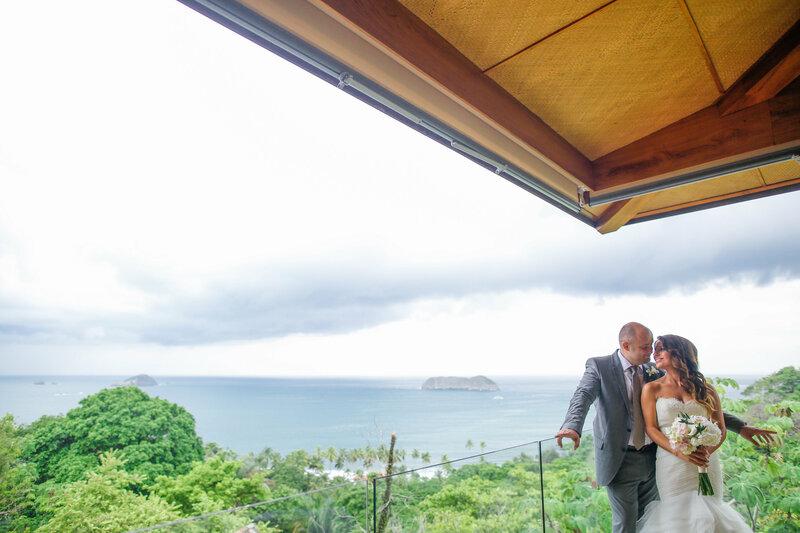 An adorable couple crazy in love at a jaw-dropping villa overlooking the Pacific Ocean in the middle of the rainforest? Nope, it’s not the elevator pitch for an epic romantic movie but the real-life wedding of Camille and Emmanuel. And we have the photos to prove it from the wildly talented Jonathan Yonkers. 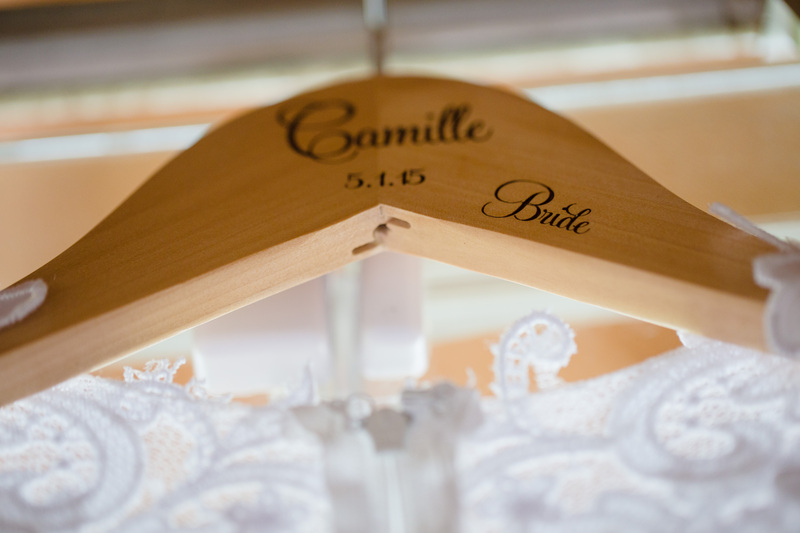 How adorable is this customized wooden hanger? 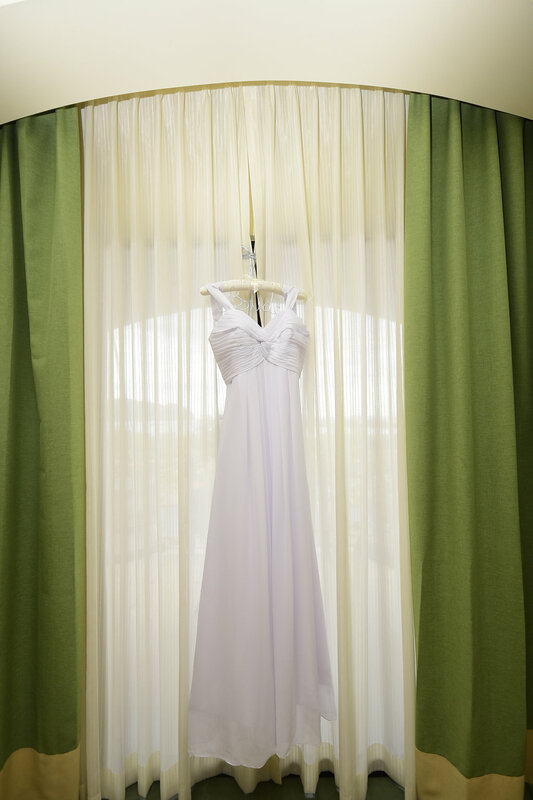 Brides, be sure to have a nice hanger for your dress as you need something strong yet pretty for photos. Etsy has oodles of great and affordable options! 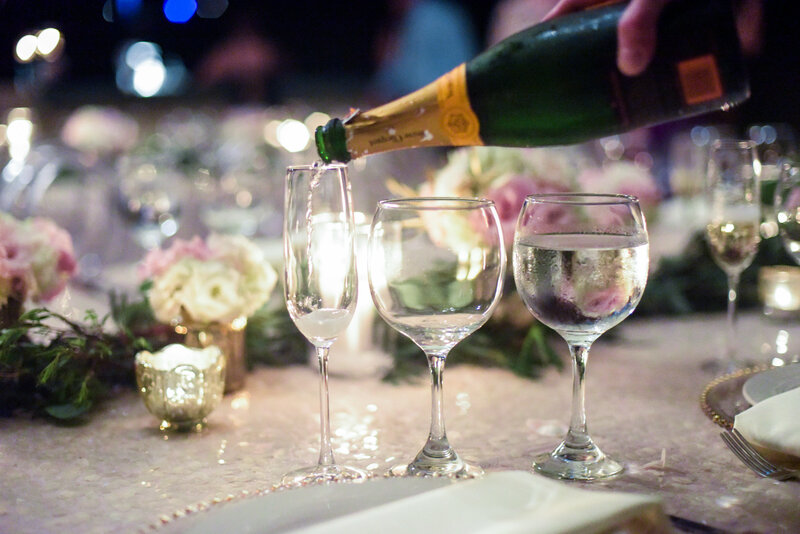 Nothing like a little bubbly to celebrate the day! The 5th floor of Punta de Vista has this incredible panoramic view of the ocean. 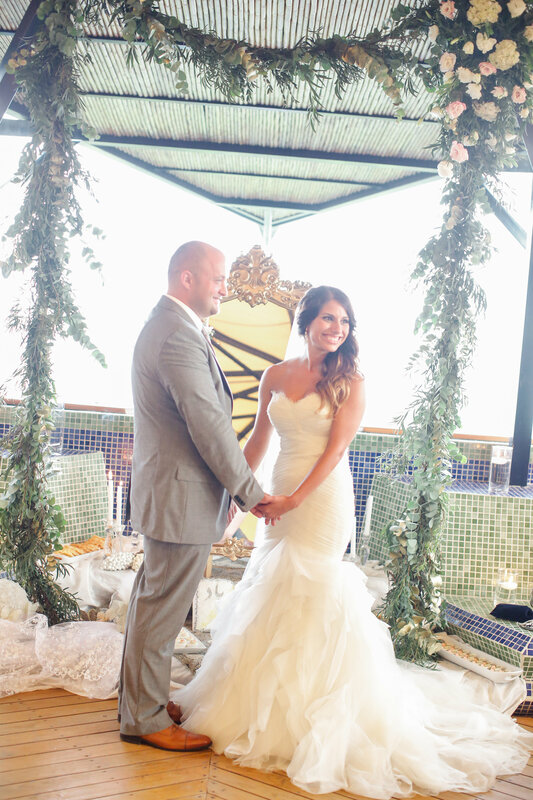 Rose petals, some soft draping and white bamboo chairs were the perfect touches to such a stunning backdrop. 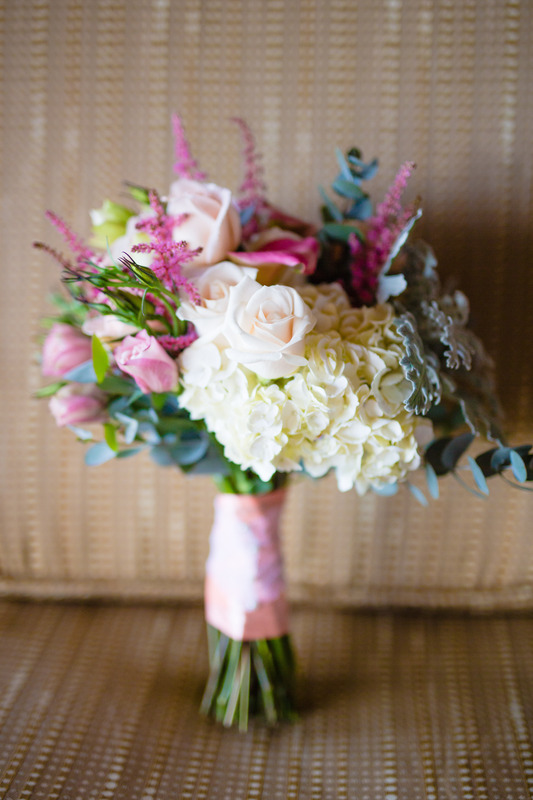 So soft and romantic, this bouquet features hydrangeas, roses, dusty miller, astribe, eucalyptus and lisianthus. 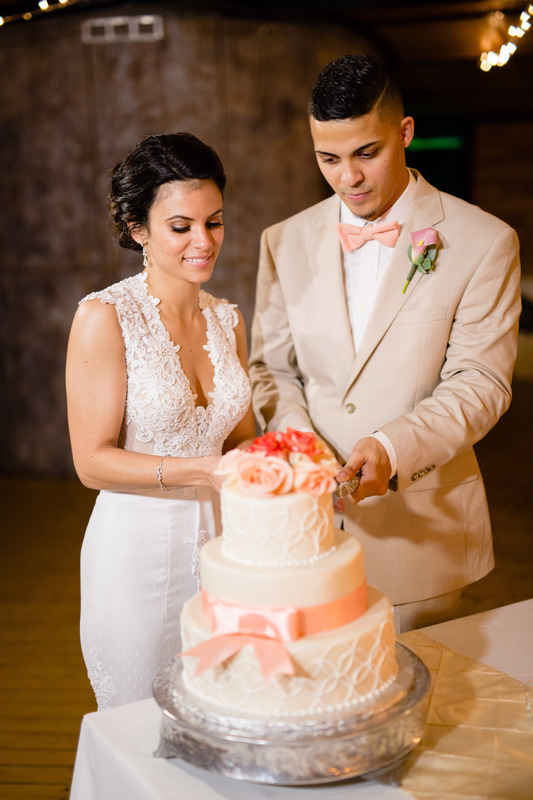 Camille’s dress had gorgeous lace detail work! Bridesmaid’s brigade to the shoe rescue! A family friend conducted the ceremony, which made the day that much more special and meaningful. 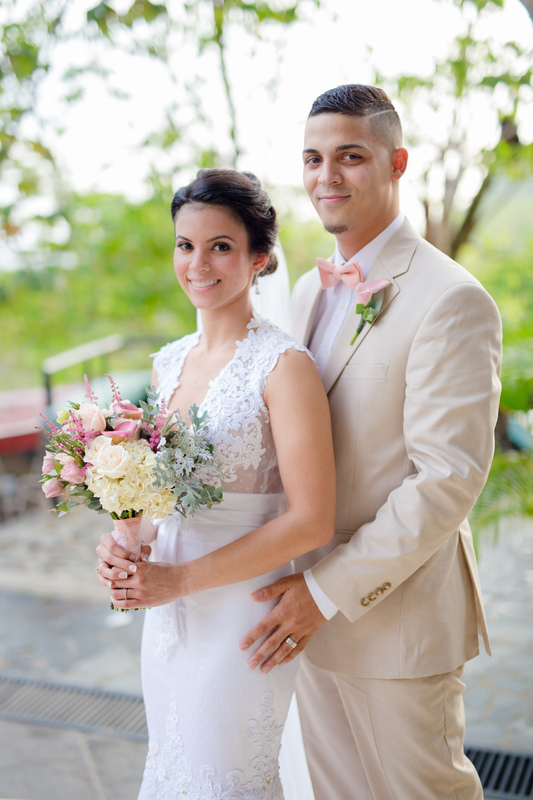 Emmanuel’s pink cala lily boutonniere matches perfectly with his bowtie and Camille’s bouquet. And they are so happy together! 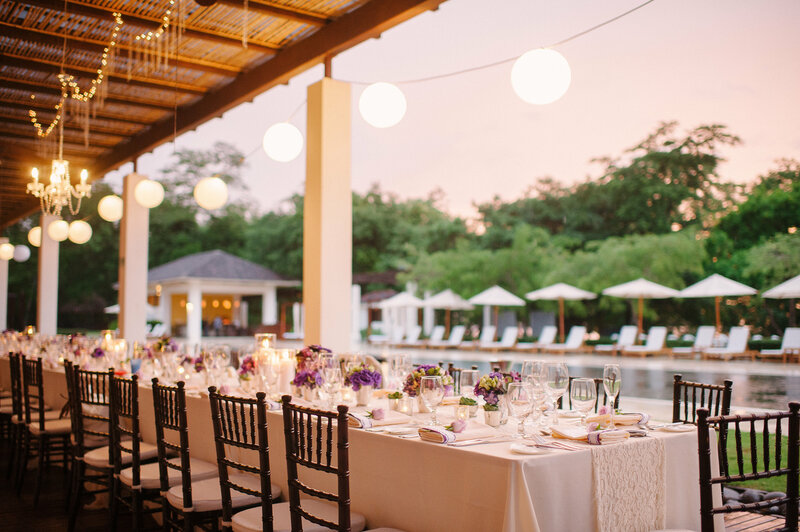 During the cocktail hour, super-planner Chelsea and her team switched over the space from ceremony to sumptuous dinner set up. 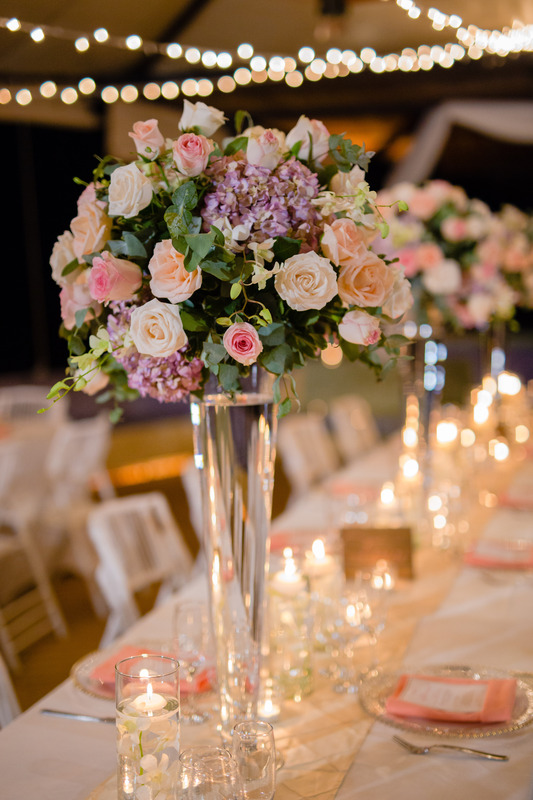 Love the tall vases with roses and lisianthus! 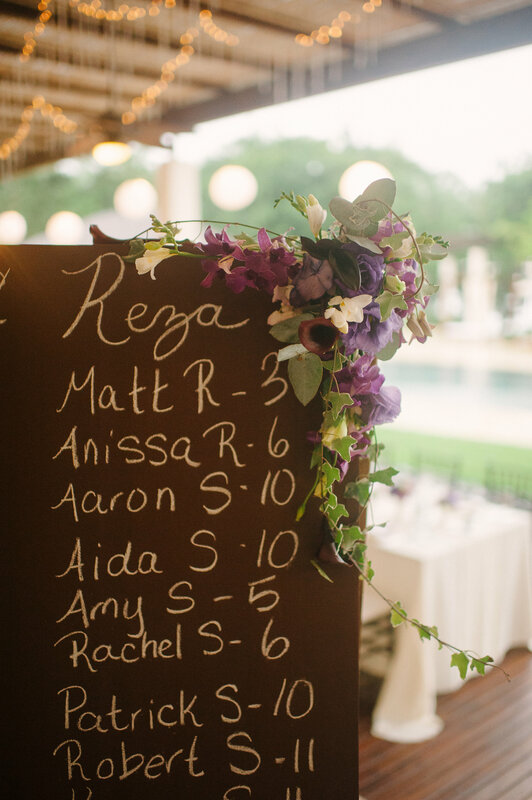 Wooden signs with calligraphy added to the vintage feel of the decor. Gold hobnailed glass chargers finished off the tables beautifully. 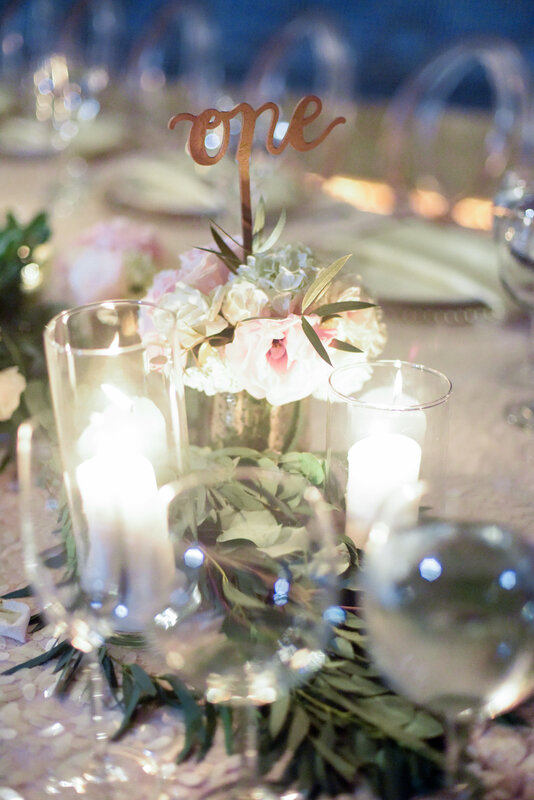 So pretty with the lights and lush flowers! 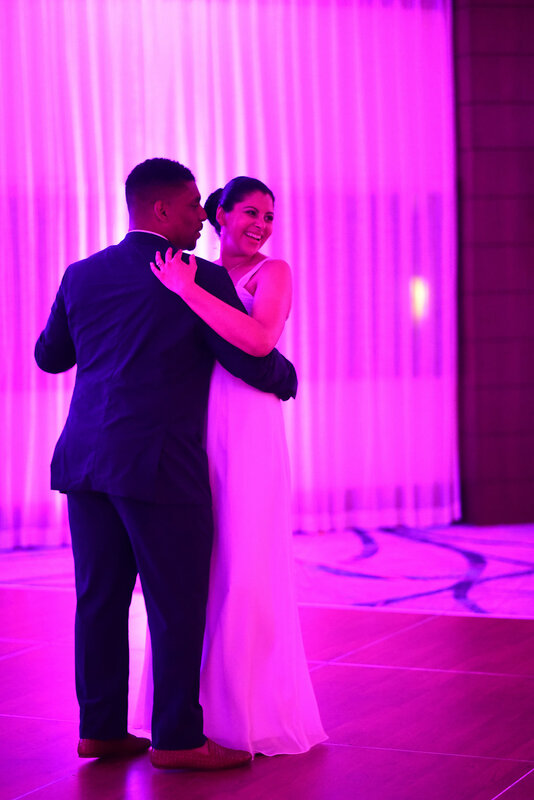 Nothing like a first dance that rocks out. How pretty is this cake!? The circle design is modern yet the overall feel is still very romantic. And the bow perfectly ties in the flowers, bow tie and napkins. Felicidades to Camille and Emmanuel! Huge thanks to Chelsea and crew for such a fantastic wedding and here’s wishing many happy years to the bride and groom! *Today I’d like to welcome Sarah Caulfield from Nixplay for a guest post on gorgeous settings for beautiful weddings. 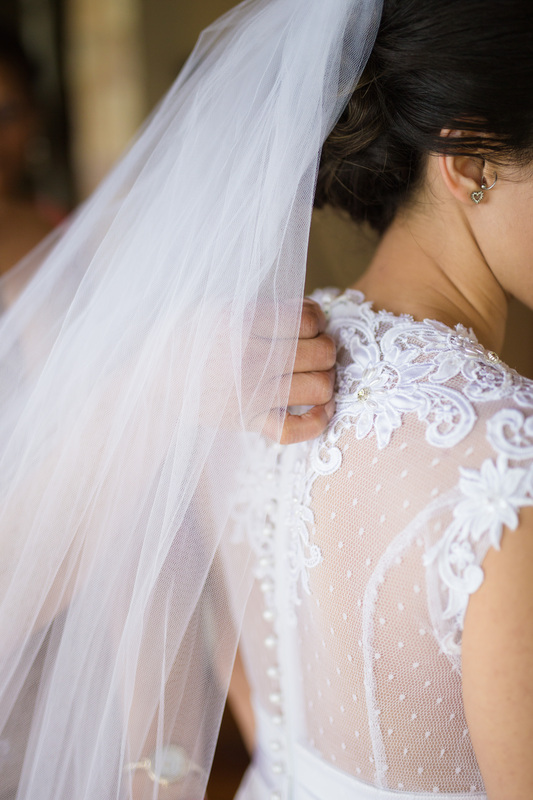 Getting married is a big deal – something to remember for a lifetime. 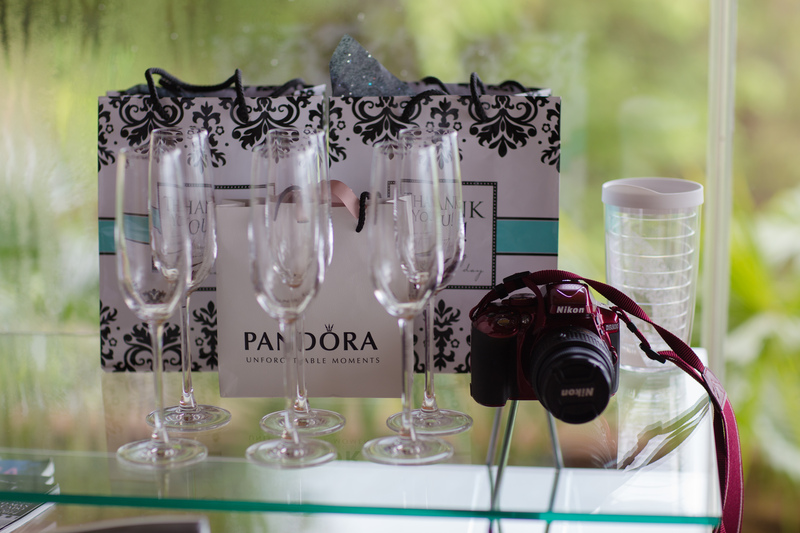 Naturally, you’ll want the occasion of your wedding to be memorable, not just so it sticks in your mind, but so you can bring back fantastic photos to share with people who weren’t able to be there, or to keep so everyone can see how beautiful the occasion was in every way. You can display your memorable pictures in a beautiful photo album, or if you’re more on the tech-savvy side, a digital picture frame. Regardless, these pictures are some of the most precious mementos you’ll have. And some places are just better than thers when it comes to picturesque wedding venues. Of course, there are the standard places to go, like Hawaii, or the still-risque and almost shockingly vibrant Las Vegas, but there are many, many other places you can get married where the photos taken can inspire deep feelings for years to come. Some of them are hidden treasures you may not have ever considered otherwise. Imagine the clear blue waters of the Caribbean, expansive private beaches, beautiful resorts with golf, horseback riding, boating, spas, and so much more – without ever going to the Caribbean. This is Sea Island, in the state of Georgia. If you head to the Caribbean, you’ll have to deal with tourists. Here, you can have a perfect beach wedding, without a tourist in sight, since the only people on the island are visitors to the two resorts placed there. What about an Alpine winter wedding, no travel to the Alps required? Ski season in Park City, Utah provides a beautiful snowy landscape not only great for a picturesque wedding, but for skiing. Once a mining town, it’s now the site of a number of glamourous resorts, easily the equal of what you’d find if you went to Europe. If skiing isn’t your thing, summer is a wonderful time to come, with plenty of outdoor activities to occupy you and your guests both before and after the nuptials. 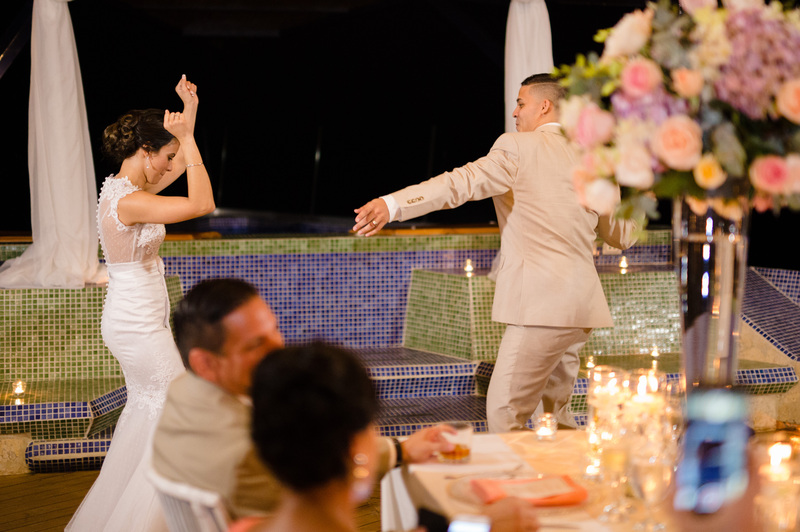 If hot environs don’t bother you and your wedding party, a Florida Keys summer wedding can a great venue. With more than 100 miles of islands from which to choose, it’s almost impossible to not find one to your liking. These islands are an absolute paradise when it comes to wildlife and natural surroundings, which can provide you with many amazing photographic opportunities. 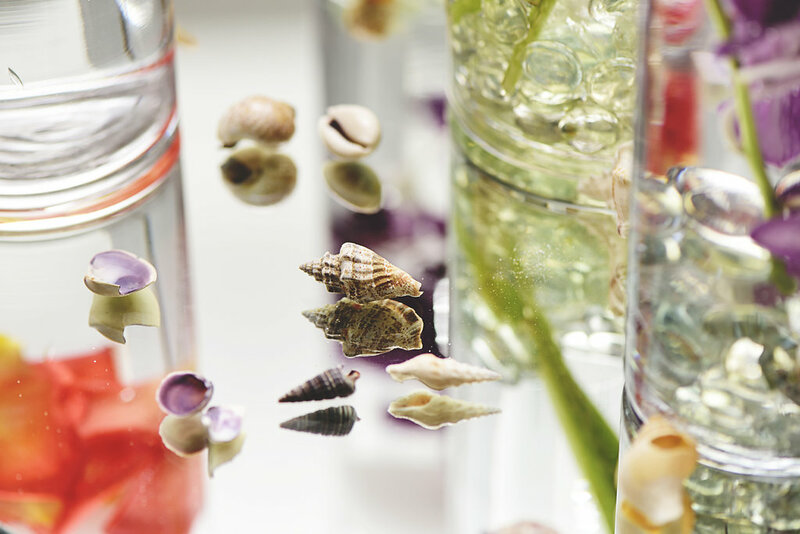 If you really want to go for the unusual and exotic, look into an underwater ceremony in Key Largo – just remember to invest in underwater cameras! Spectacular fall foliage is not just found in New England. Get married on Mackinac Island in Michigan for a unique experience. A National Historical Landmark, Mackinac Island has a distinctly 19th century vibe. In fact, you’ll have to travel on the island by horse and buggy, or bike, because there isn’t a car to be found on the entire island. 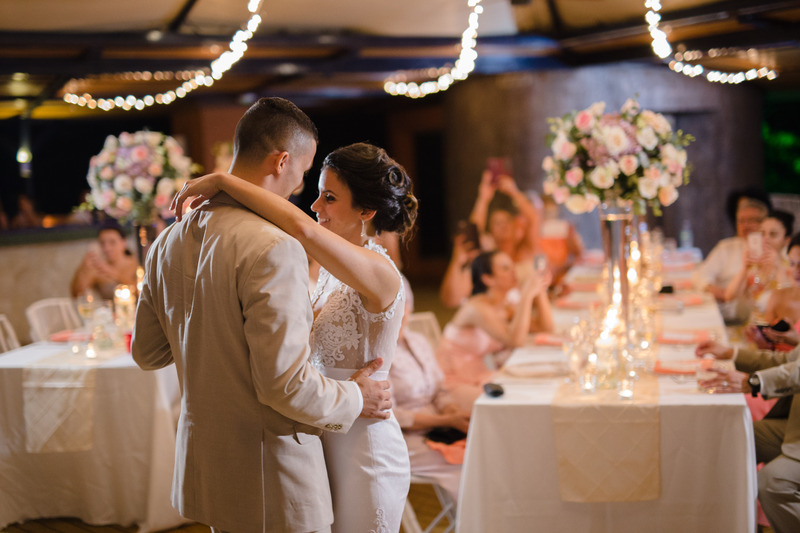 With venues ranging from the Victorian era to colonial forts, you can have a wedding transported backward in time to an earlier era. The northern locale can make weather tricky, so it’s best to plan your trip in October to catch the changing colors of autumn. 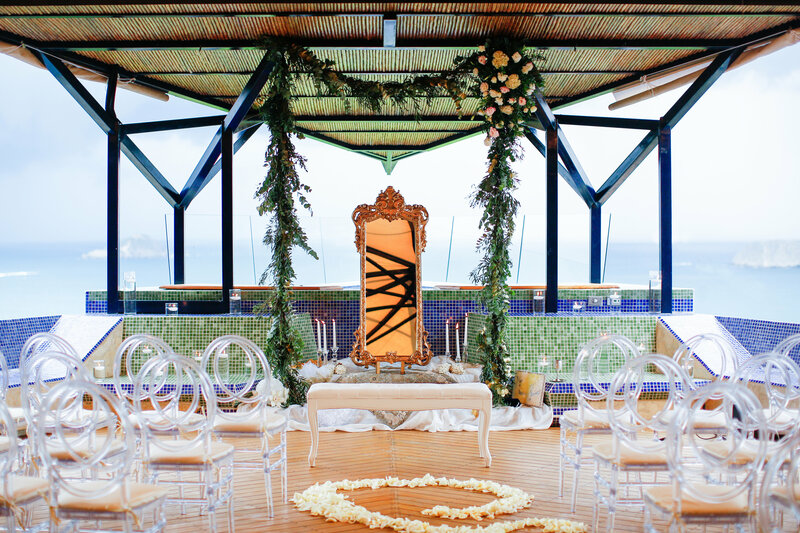 Leaving the U.S. behind, there are few countries as full of great wedding venues as Italy. While places like Rome or the Tuscan region will always have its share of visitors, there are some (slightly) less traveled places, like the Amalfi Coast that will give you the Italian wedding experience with somewhat less of the bustle. Being located in Italy, you can be sure you’ll have superb catering at your wedding. As for photo opportunities, the cliff-side vistas of the Mediterranean are truly spectacular. While Paris is lovely, it’s not the only place in France to get married. One place you might put into your list of considerations is the Loire Valley, about two hours from the City of Lights. 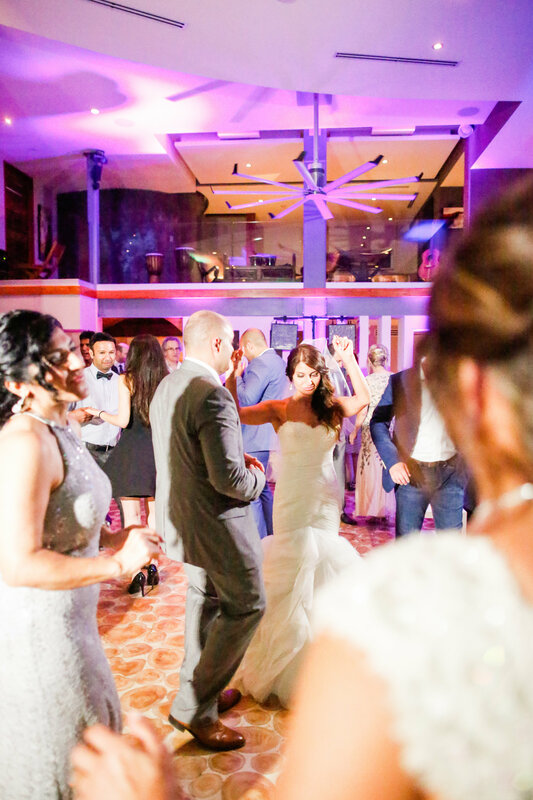 Though popular in mid to late summer, visitors to the region outside that time frame can enjoy a memorable wedding experience without contending with large crowds. Centuries-old castles and villages are just a few of the places and memories you can capture if you choose the Loire Valley to celebrate your union. 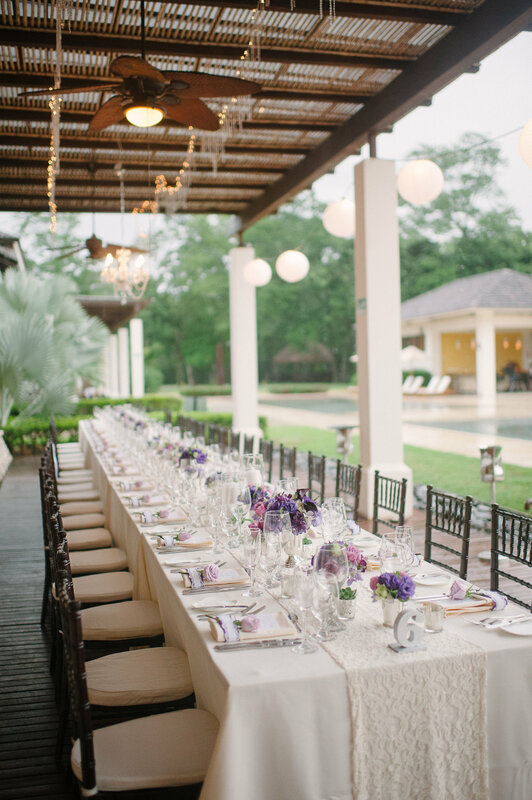 If you’re looking to have your wedding in late winter or early spring, Costa Rica may be the perfect place for you. It offers two coasts – the Caribbean and the Pacific, either one of them the perfect balance of tropical wildness and modern amenities. 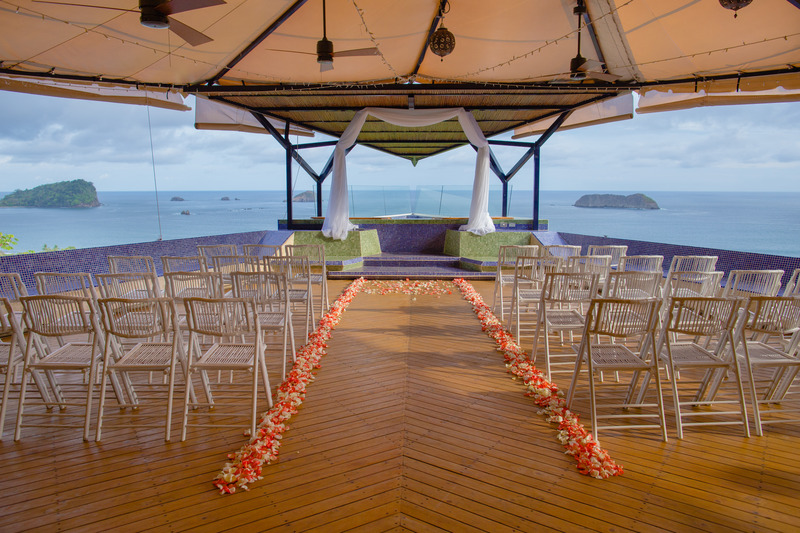 Naturally, it’s perfect for beach weddings, on one of the pristine stretches of white sand, but if you venture into the nation’s interior, there are mountaintops, lush rain forest reserves, and other places of natural beauty for those who want to get married close to nature in its purest form. This is, of course, more than a place for venues. 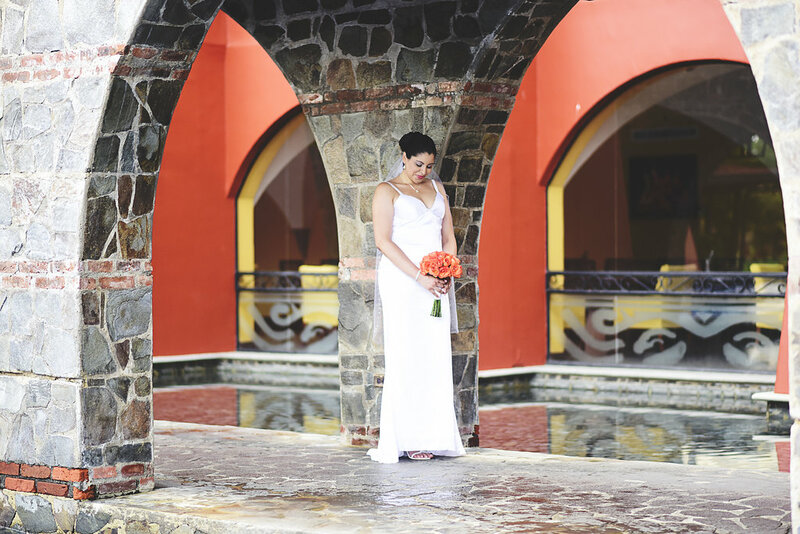 It’s a whole continent, which means you have almost unlimited options to explore for the picture perfect wedding. For those who like to stay close to city comforts, Australia offers spectacular skyscapes and architecture in many of its cities around its coasts. Those looking for more natural settings can turn to the starkly beautiful Outback, or to the teeming colors and wildlife of the Great Barrier Reef. Australia’s truly unique ecology can offer some truly unique photo opportunities for your wedding. For information on ways to take memorable wedding photographs to fill your photo album and digital picture frame check out this blog post from Nixplay.com. Laura O’Donnell writes smart content on behalf of the digital picture frame experts at Nixplay. As an avid writer and learner, she loves to use her skills for engaging others in important topics in creative and effective ways. When she is not working, she loves meeting new people, traveling, and bringing her Pinterest dreams to life. Find her on LinkedIn. Maggie and Thibault know how to have a lot of fun. She’s Costa Rican, he’s French, they live and work in London and have a joie de vivre that is universal. 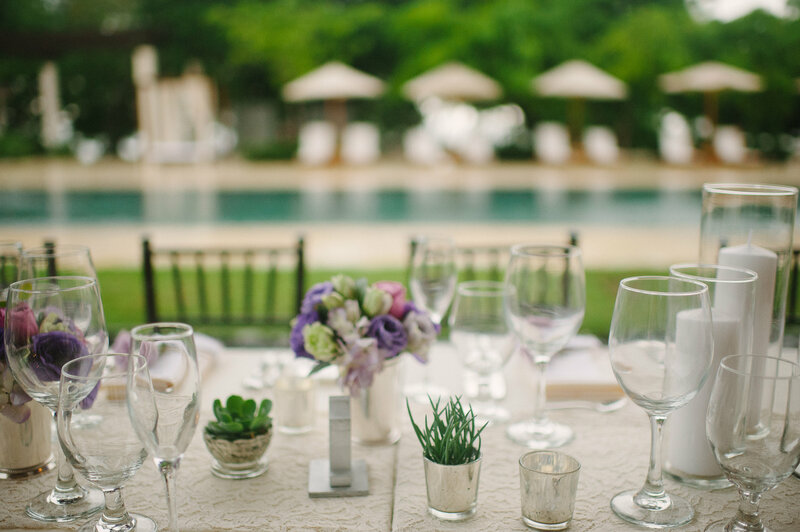 Not surprisingly, they had close to 100 people from all corners of the globe descend upon Hacienda Pinilla to celebrate this celebration de amor. Mil gracias to Madison Baltidano for her gorgeous photos. 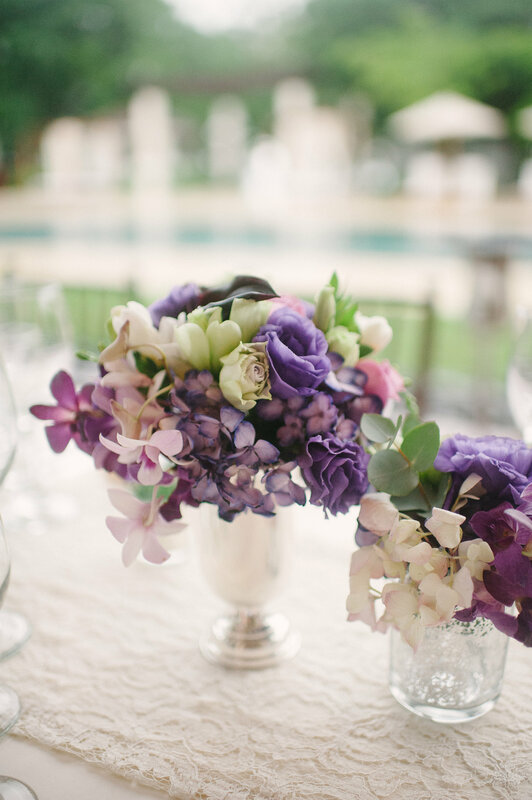 Lisianthus, hydrangeas, orchids and baby’s breath created an ethereal bouquet. Love the structured lines of this dress. Did I mention Maggie is an architect? No wonder her wedding had such great design! One stylish looking groom! Thibault relaxes outside the Church before the ceremony. Love his navy linen suit and bow tie. Hacienda Pinilla has a small chapel on its grounds which we used for the Catholic wedding ceremony. 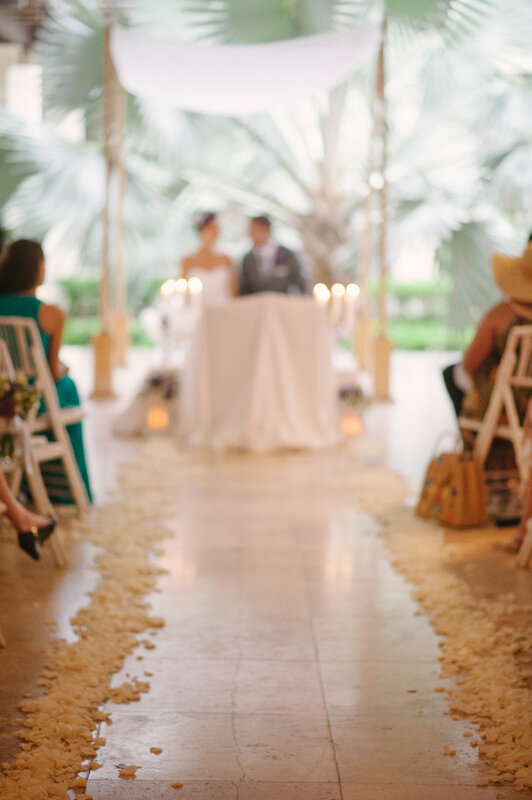 The chapel features typical Guanacaste architecture and decor, with it’s whitewashed walls, rich wooden doors and beams and clay tiled roof. Going with an all-white floral theme, hydrangeas, calls and baby’s breath created simple yet structured arrangements for the Church entrance. Guests were greeted with white Chinese fans and cones of rose petals. Inside the Church, the wooden benches are carved in typical Guanacaste-style. Such a quaint chapel! Being a ring-bearer can be a daunting task for a little girl but she did her job beautifully. 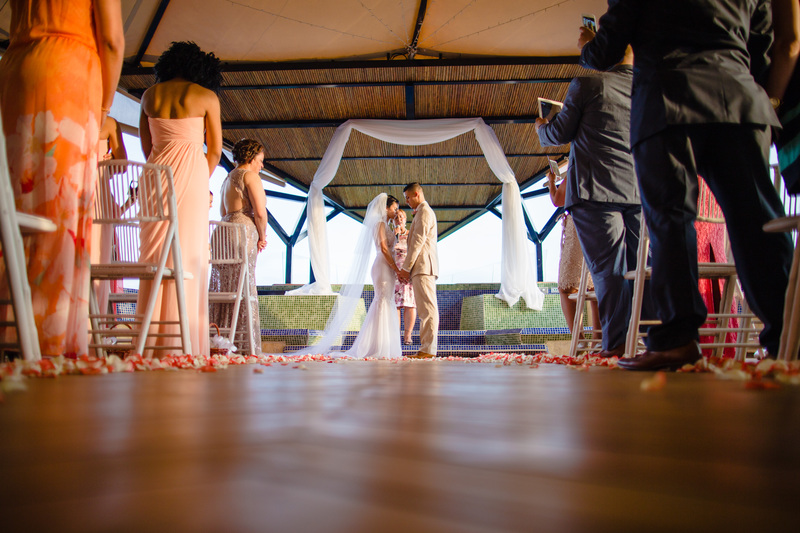 White-washed walls, wooden beams and a view to the mall lake make the chapel at Hacienda Pinilla a lovely space for a religious wedding. Happy hour featured a mix of fun cocktails, including a lychee mimosa (recipe below). Place lychee fruit at the bottom of a champagne flute. Spoon lychee juice into glass. Pour champagne over fruit and juice. 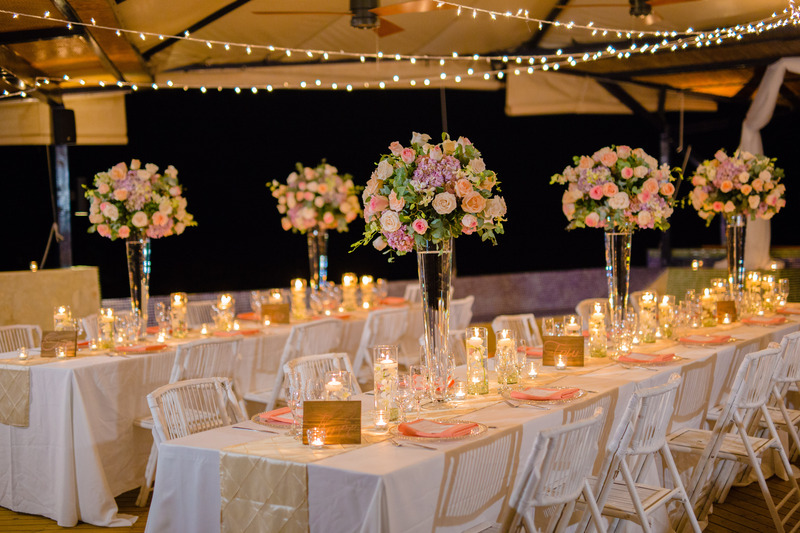 Each dinner table on the lawn overlooking the beach featured ivory crinkled overlays, gold chargers, gold Chiaveri chairs and custom-made golden flower holders that evoked an Art Deco theme. 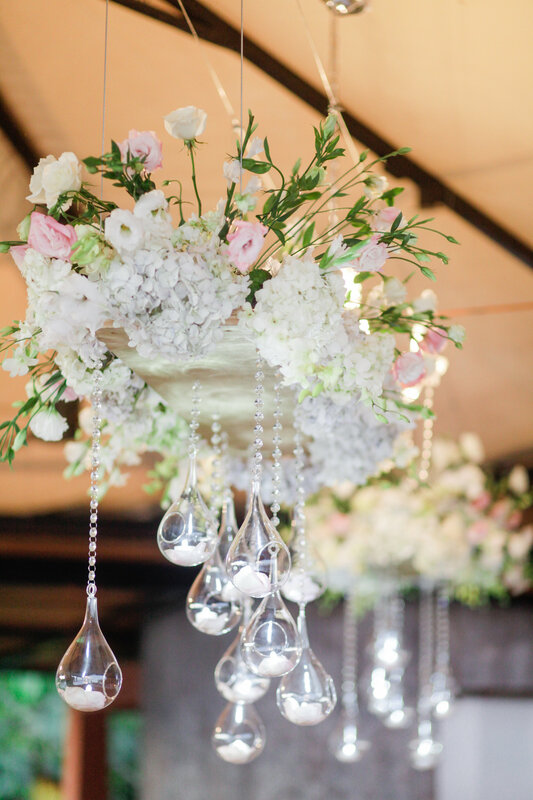 A riot of light, fluffy flowers such as lisianthus roses, hydrangeas and orchids created a lush counterpoint to the architectural lines of the floral base. 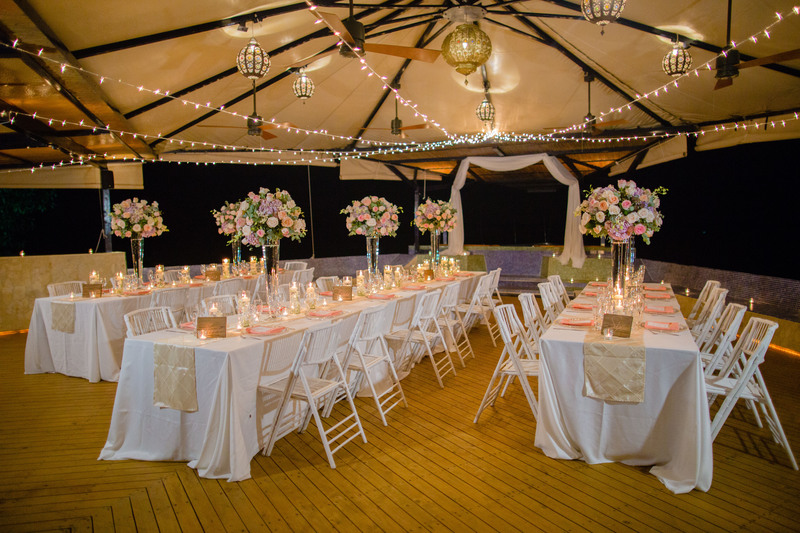 White Chinese lanterns were strung over the tables and colorful LED lights lit up the trees around the dining area. We set up a table just for the kids, covered in craft paper with small pots filled with markers, crayons, stickers and small toys. Professional nannies kept watch, allowing the parents to enjoy the party while the children had their own fun. Win win for everyone! 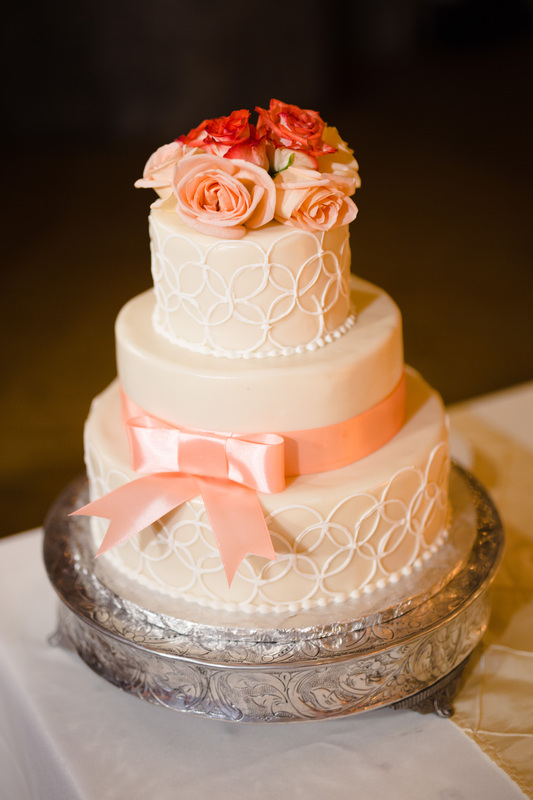 How beautiful is this all white cake with ombre pink rose petals? Fabulous design! Cigars, get your cigars. As a surprise to their guests, the bride and groom hired a cigar roller to demonstrate the fine art of creating the perfect stogy. Fun fact – the tobacco in Costa Rica is grown from Cuban seeds, making these robustos smooth smoking. Carnival!! The fun and surprises continued with a group of drummers and dancers known as Carnival or comparsa, similar to the tradition found in Rio. Befeathered and bedazzled dancers shook their tail feathers to booming drums and then had the wedding guests up dancing and shimmying in a conga line. Too. much. fun! Everyone was up dancing, regardless of age! What a celebration! Felicidades to Maggie and Thibault on one fun-filled festival of love. 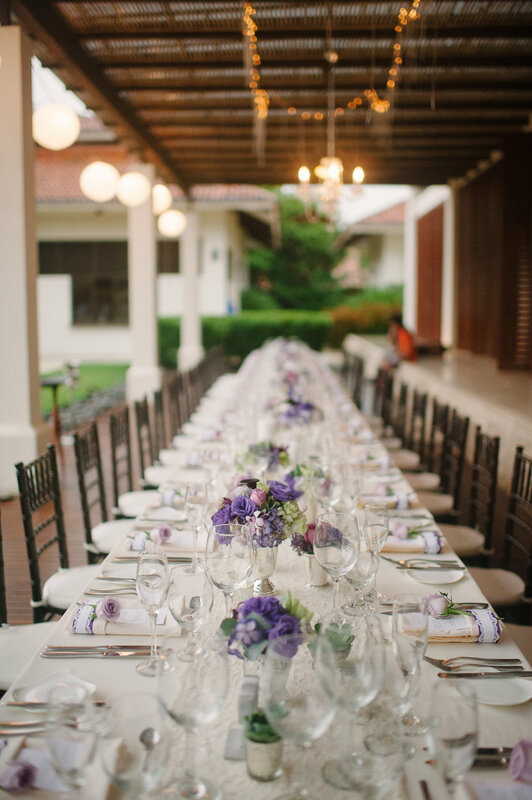 Cross-cultural weddings are always so memorable and Neda and Stan’s definitely was one of a kind, with a Persian & Jewish ceremony overlooking the rainforest. 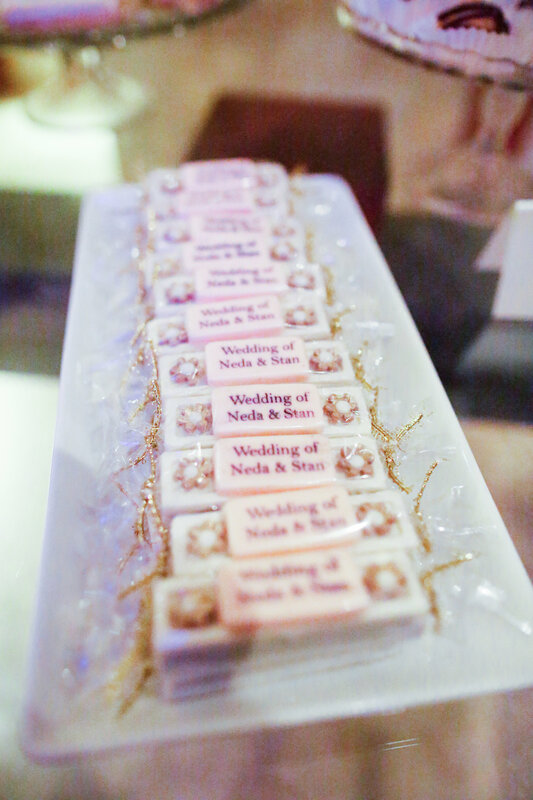 Neda is a wedding planner in LA so needless to say, her own wedding had loads of style. Love the invitation set with the gold foil. Neda opted for long curls, which showed off her luscious locks. Seriously, this is the best idea ever! Nike running shoes that are platforms! 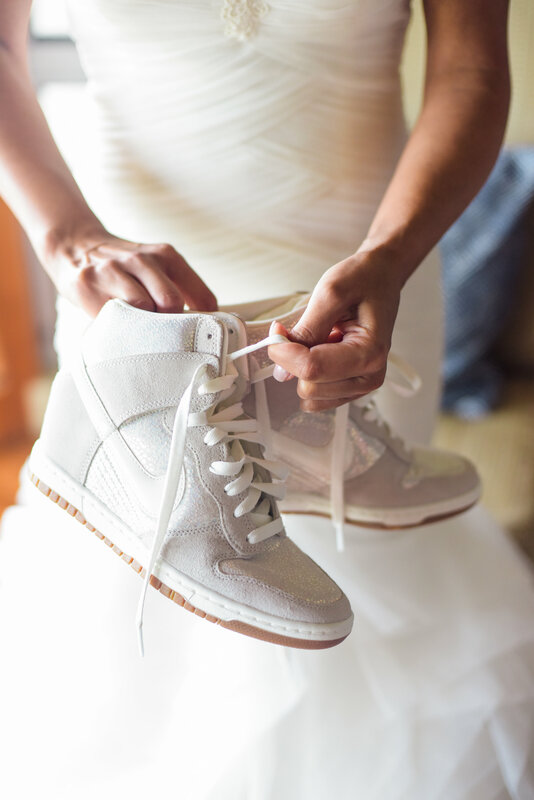 The ultimate comfy shoe that works under a wedding dress. Brilliant. 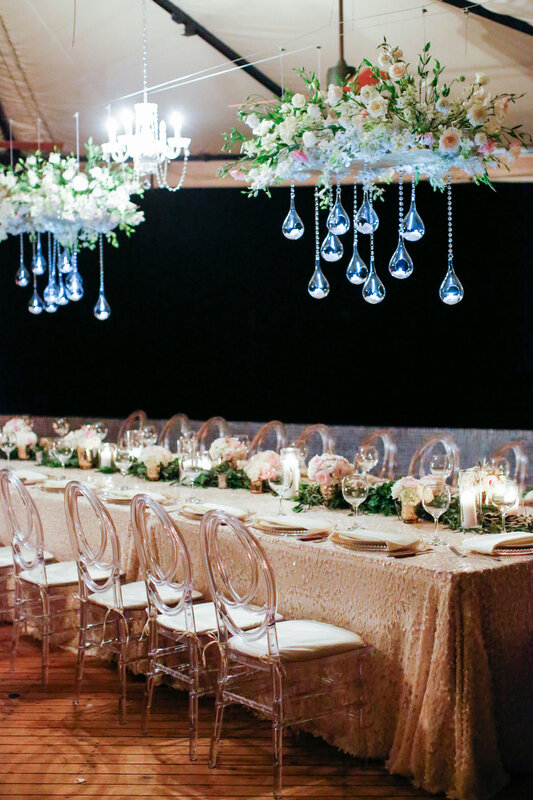 Transparent Chanel chairs gave an airy feel to the ceremony. A garland of eucalyptus and flowers outline the jacuzzi where the sofreh was set up. Close up of the elegant yet modern sofreh. 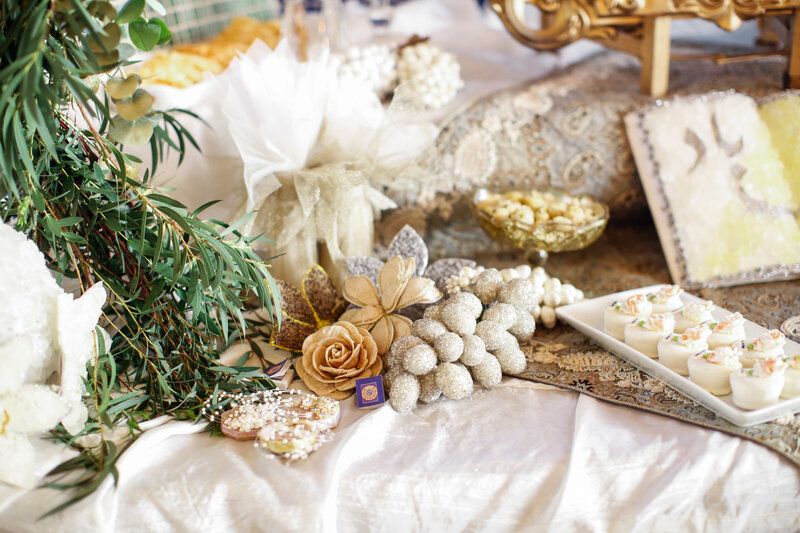 Cool refreshments and Persian sweets awaited guests as they arrived at the ceremony. 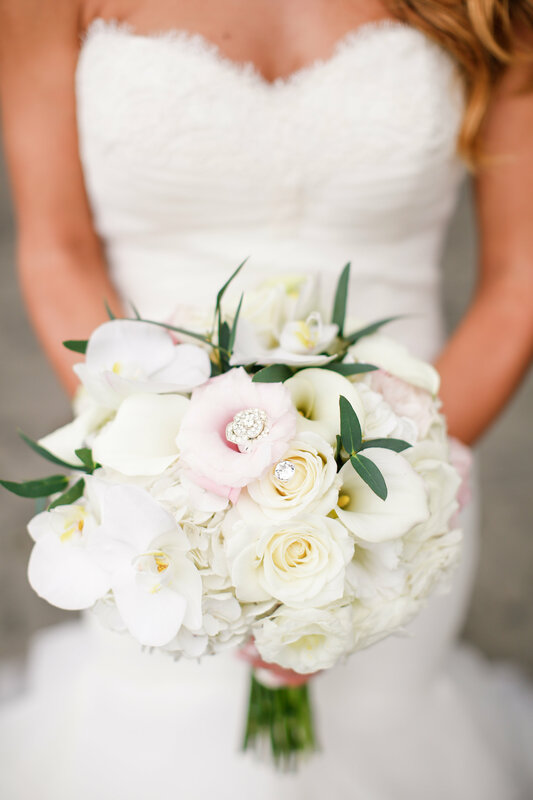 Calas, lisianthus, roses, orchids and a touch of eucalyptus created a soft, romantic bouquet with some added bling. Stan sported a boutonniere of orchids and eucalyptus on a dove-grey suit. 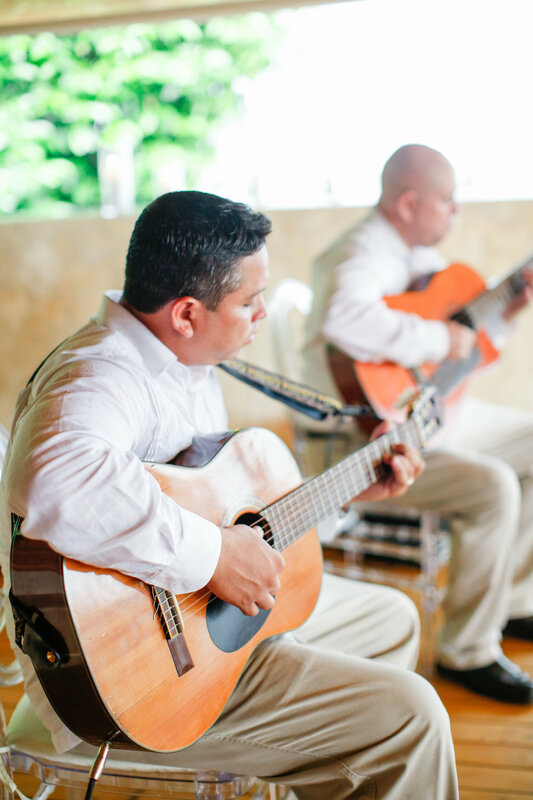 Live music always adds a special element to the ceremony. During the cocktail hour, we turned the 5th floor where the ceremony had been into the dining space, complete with hanging flower beds! 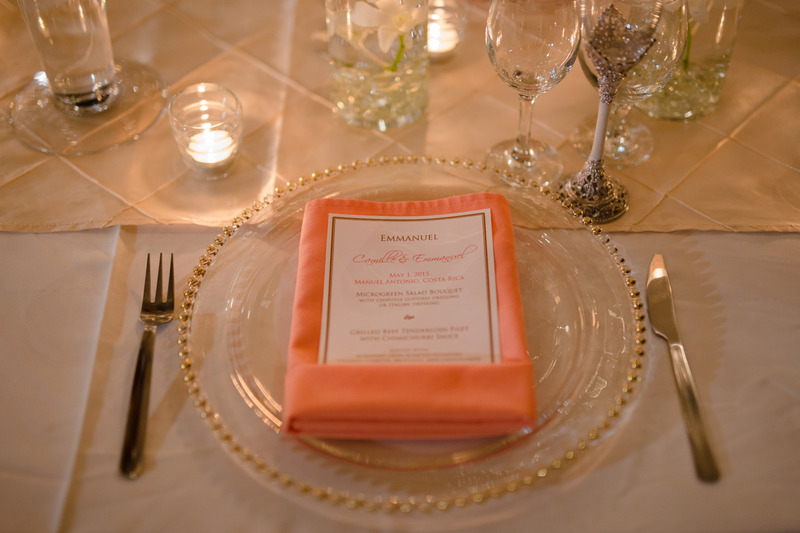 Ivory sequined tablecloths added a modern yet elegant touch to the tables. 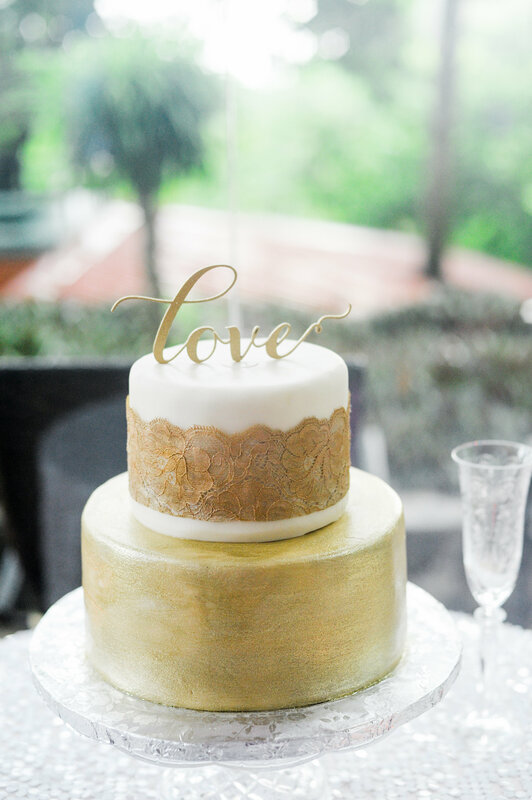 A gilded cake sat atop a glass pedestal cake base and a white sequined tablecloth. 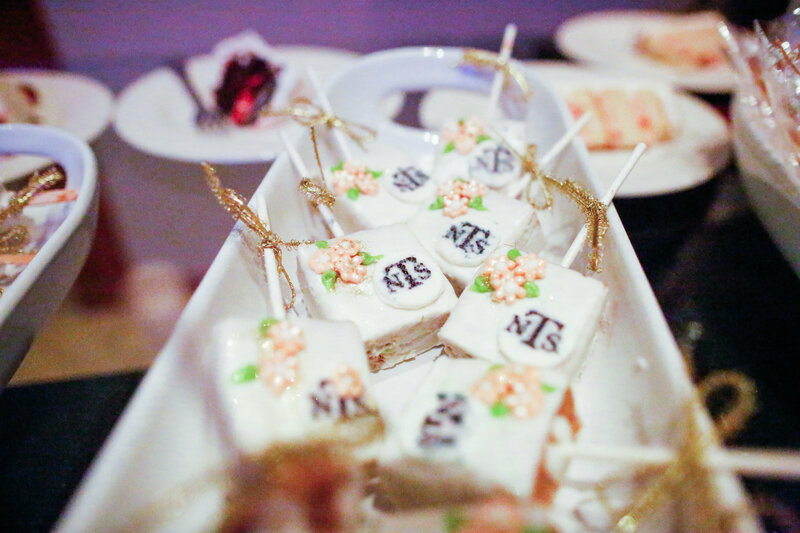 How adorable are these custom dessert forks, with their wedding date? Perfect for sharing their first piece of cake. 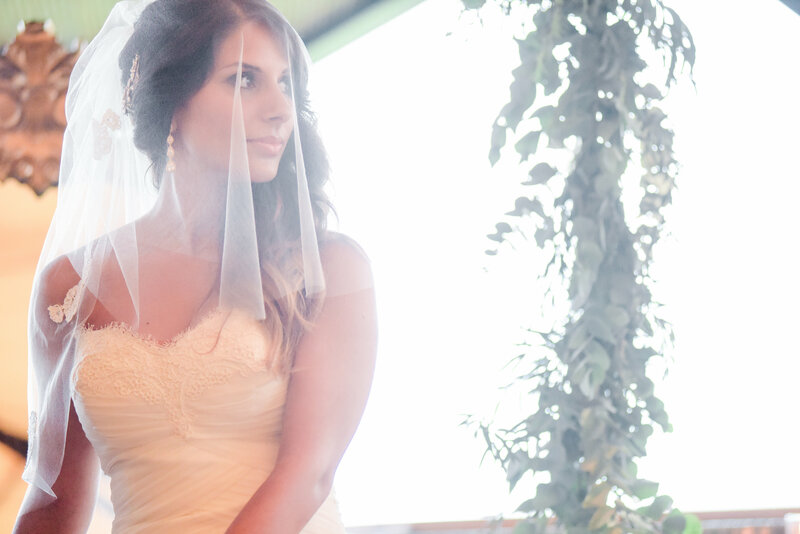 Although we did see some rain during the ceremony, the sky created a dramatic backdrop for their first-look session. Put a flower in it! 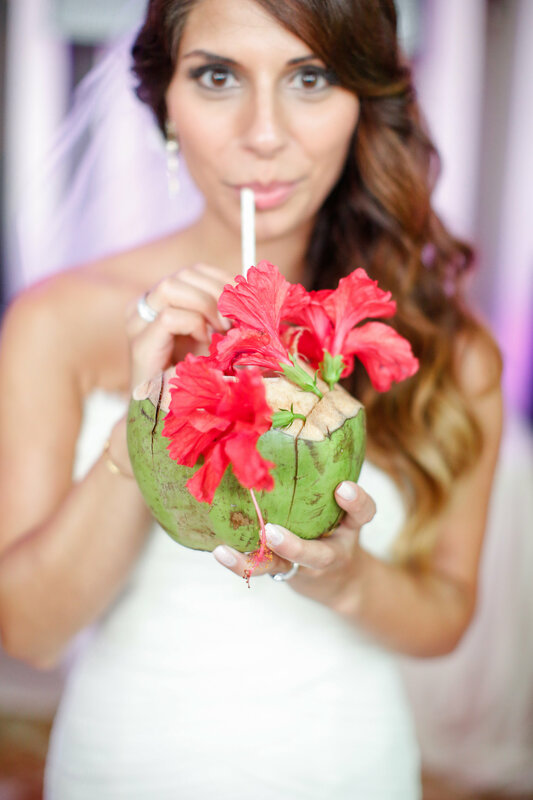 Nothing says a tropical cocktail hour like a Coco Loco in a fresh pipa. Custom-made Persian delights were sent all the way from New York . 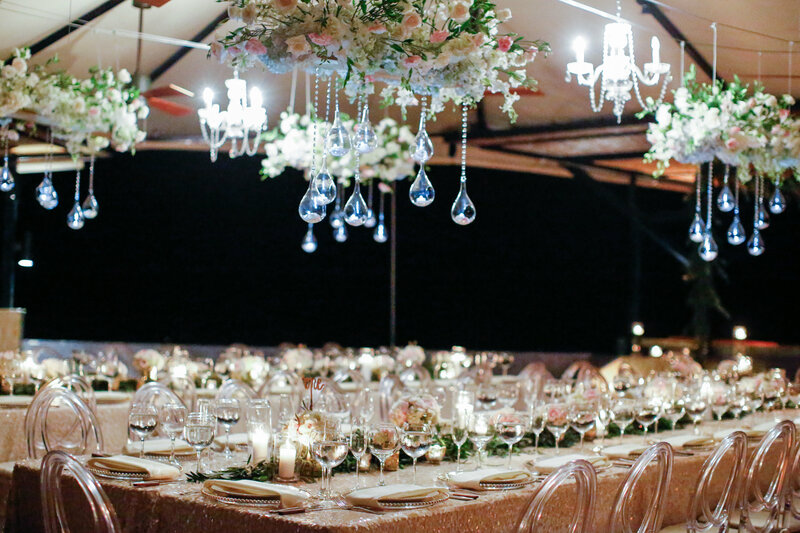 Imperial tables, decked out in ivory sequined tablecloths, garlands of eucalyptus, candles and mercury vases of romantic flowers sat under hanging beds of roses, hydrangeas, lisianthus and orchids with crystals and hanging candles. Wow! 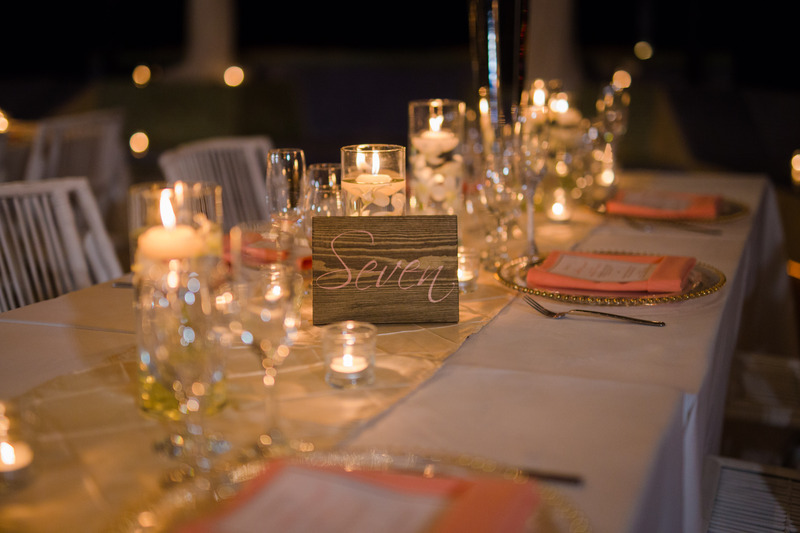 Gold Bride and Groom signs adorned the chairs at the sweetheart table and matched the table numbers and cake topper. Cocktails, dancing and speeches all happened before dinner in the ballroom. Mazel tov and تبریک to Neda and Stan! Was an incredible experience working with you and wishing you both many years of happiness! Huge thanks to Jenny Smith & Co. for the great photos! 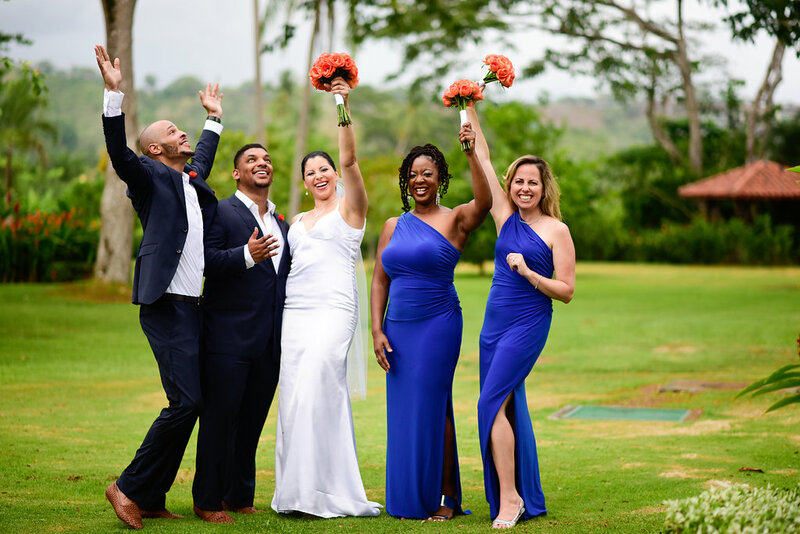 A little bit of rain didn’t dampen Yvonne and David’s spirits or their colorful wedding celebration at Los Suenos Marriott near Jaco! El Velo Photography captured all the bright fun for us to enjoy here. 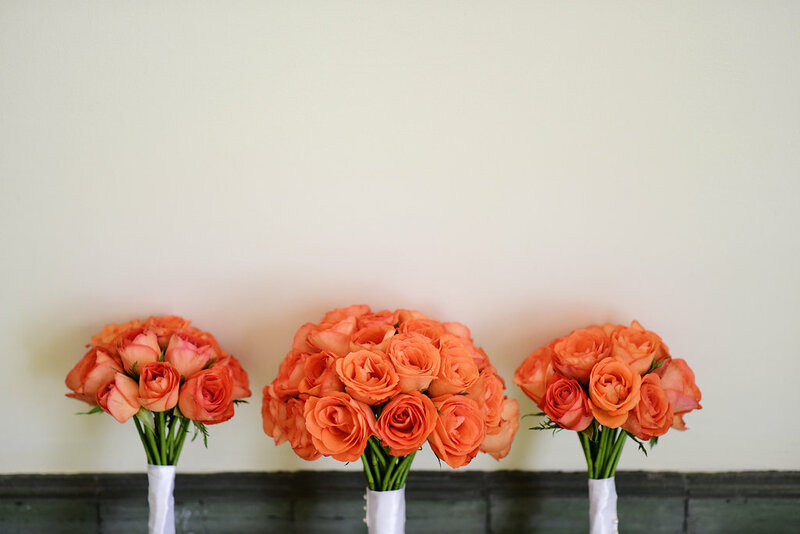 Orange roses created a bright contrast to the bridesmaids’ cobalt blue dresses. 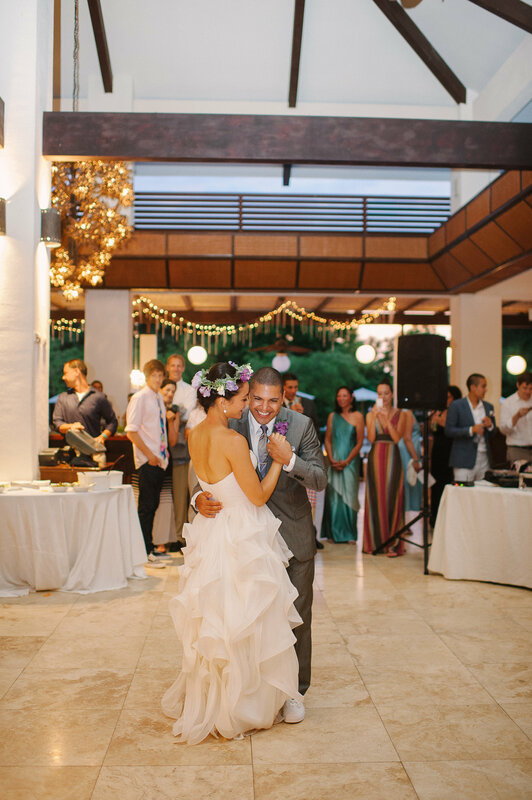 Yvonne’s dress was perfect for a tropical beach wedding with it’s deep-V back and flowing skirt. One beautiful and happy bride! 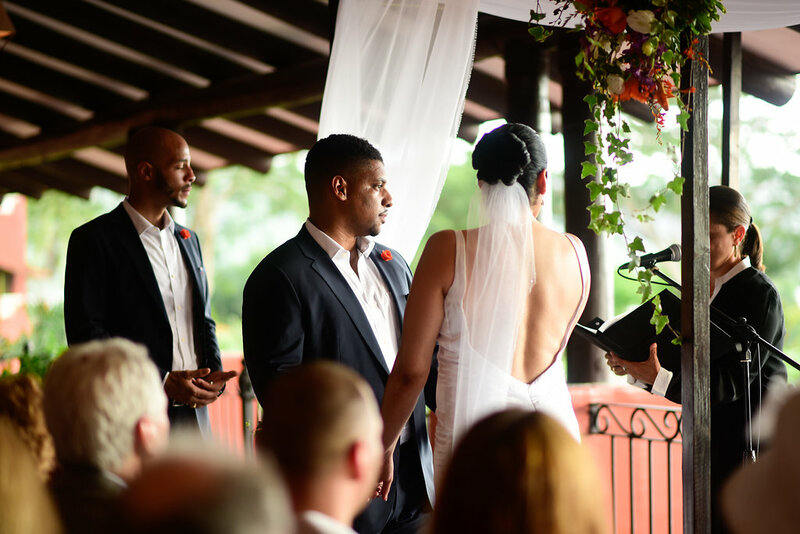 Due to the rain, the ceremony was held on the Sandia terrace overlooking the pool and gardens which still made for a beautiful setting. 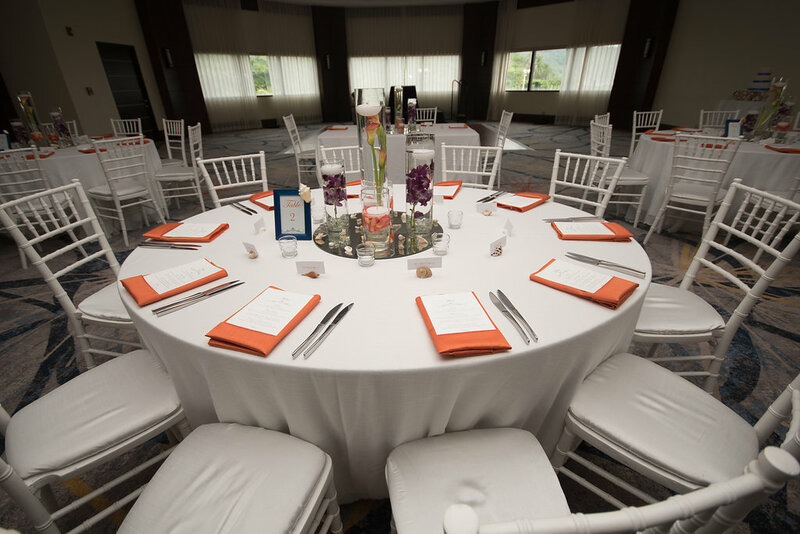 Working with a white canvas of Chiavari chairs and linens, we brought in hits of orange through the napkins and flowers for an understated tropical vibe. 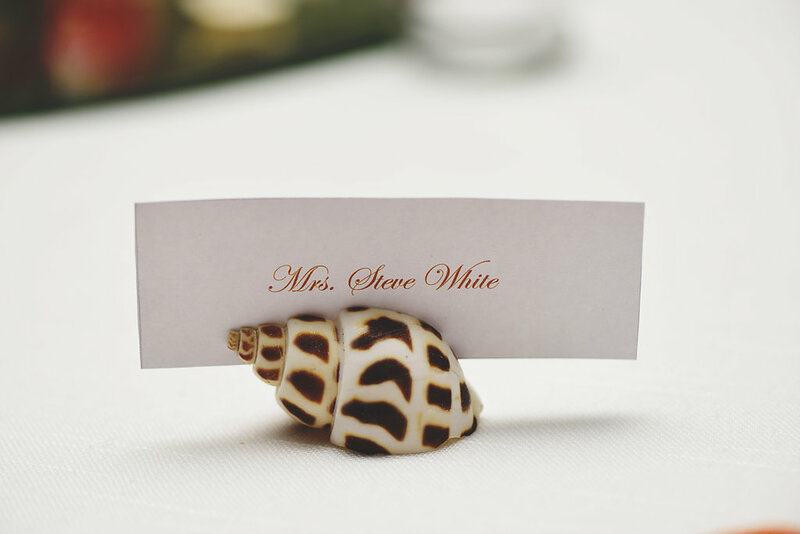 Seashell name-card holders gave a nod to the beach location. 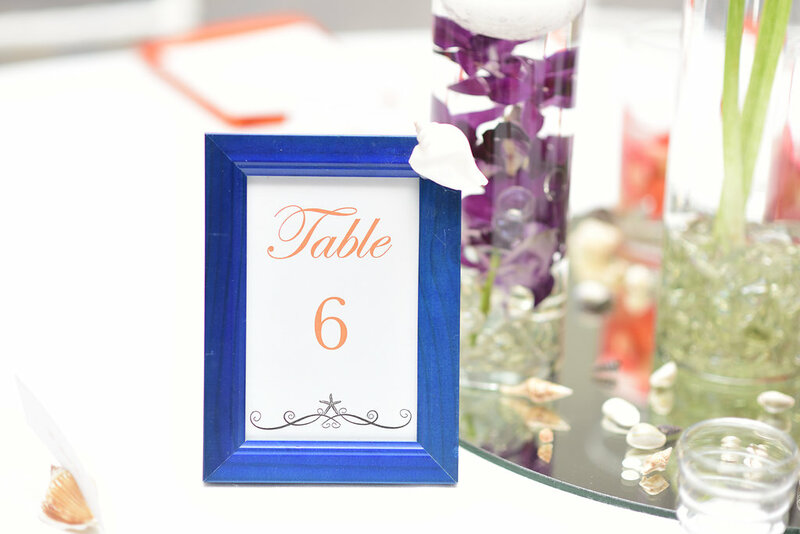 Seashells were found on the frames with the table numbers as well as scattered on the table arrangements. The architecture at the Marriott offers up many unique locations for photo sessions. 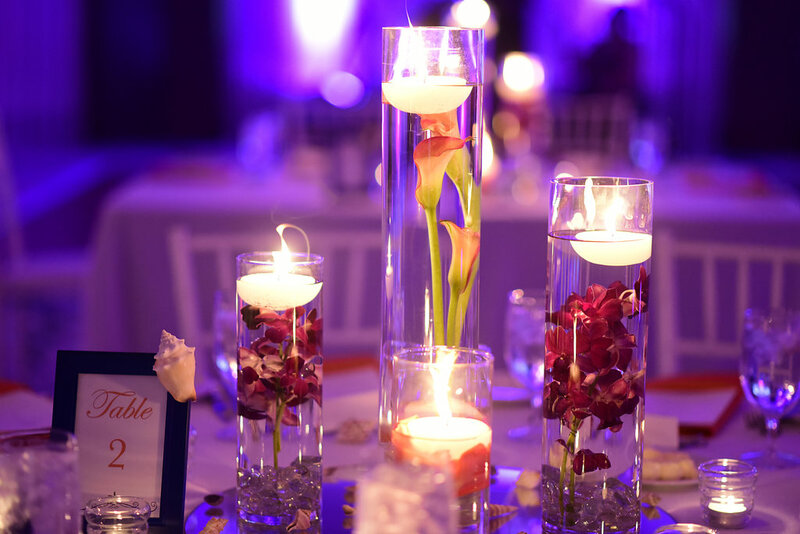 Round mirrors were a base on which cylinders with clear stones and submerge orchids and calas with floating candles were set. 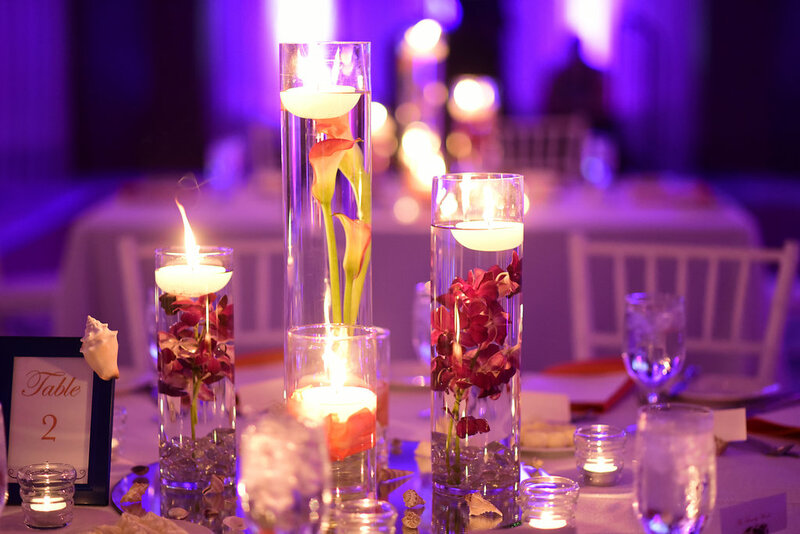 The mirrors reflected the water and candle light, imbuing the room with even more soft lighting. 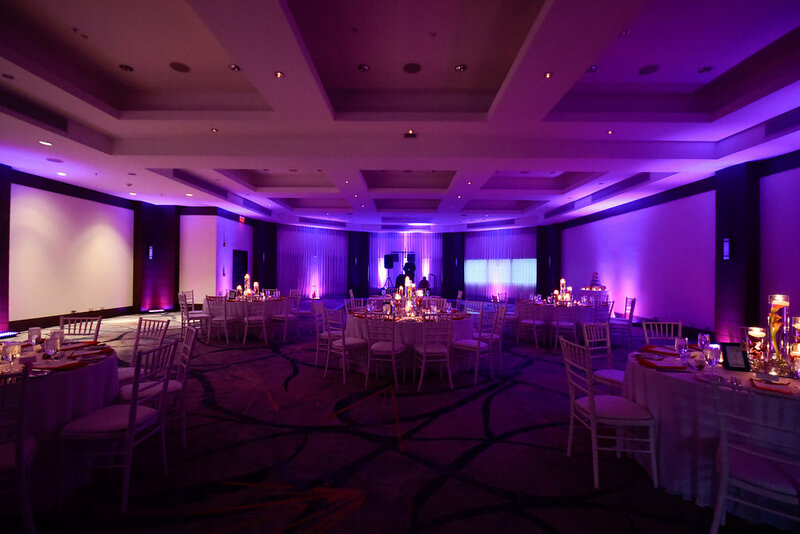 LED panels were set around the rooms to uplight the walls, creating a more intimate, romantic feel to the room. 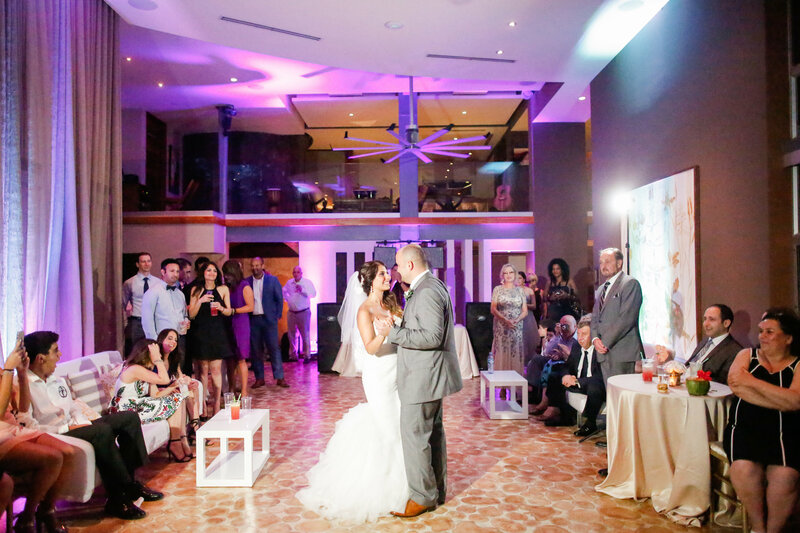 The new Carara room at the Marriott has a wall of windows and features wood and natural stone throughout as well as lower ceilings than it’s other ballrooms, making it a warm space . Cannot say enough about including uplighting to any space, as it really adds a totally different dimension. 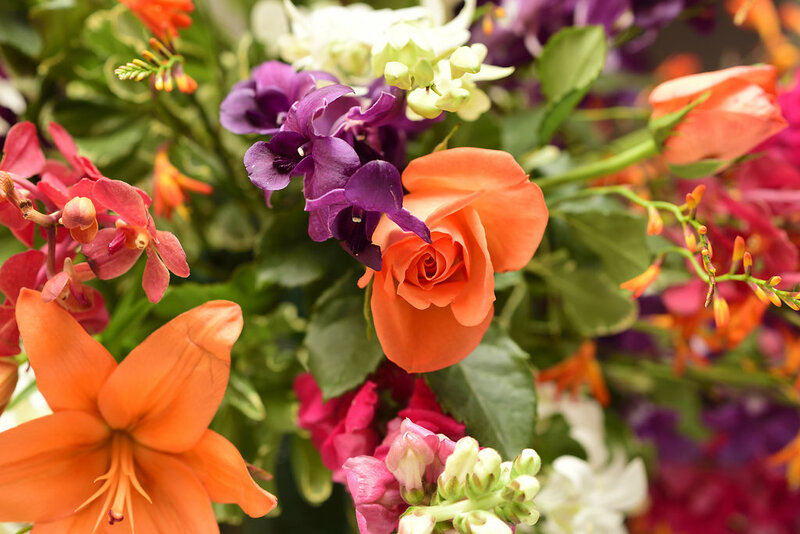 Bright orchids, roses and lilies brighten up any day. 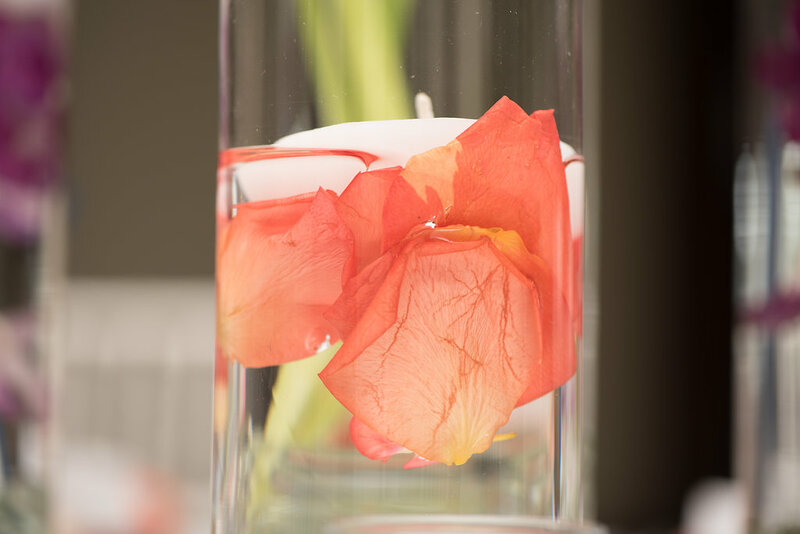 Orange roses continue in the decor, this time as a bed of petals for the floating candle. A seashell-covered cake base held a cake with blue ribbons and decorated with orange roses and white lisianthus. Felicidades to Yvonne and David! Wishing you many happy years in Club Wed! 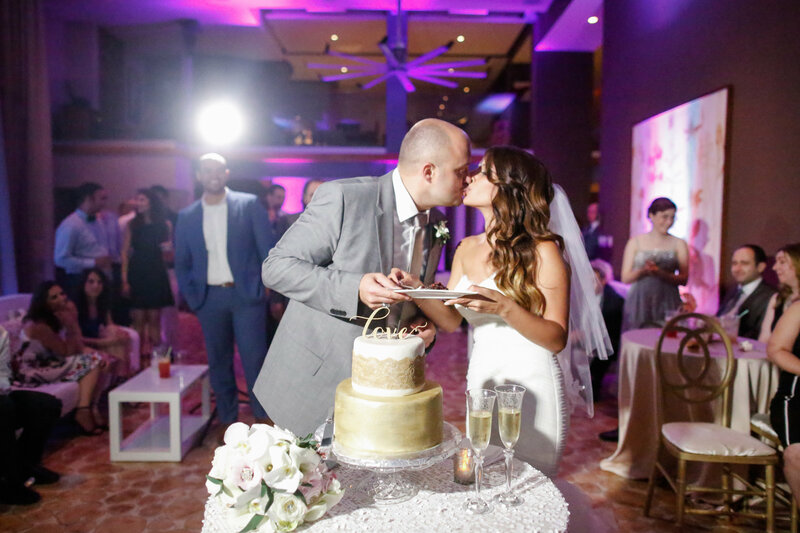 Marriage is a blending of not only the couple but their families and cultures and some of the most lovely ceremonies are those incorporating various traditions. Lia and Reza’s wedding did just this, weaving the groom’s Persian heritage with touches of the bride’s Chinese background. The result was absolutely one-of-a-kind and magical. 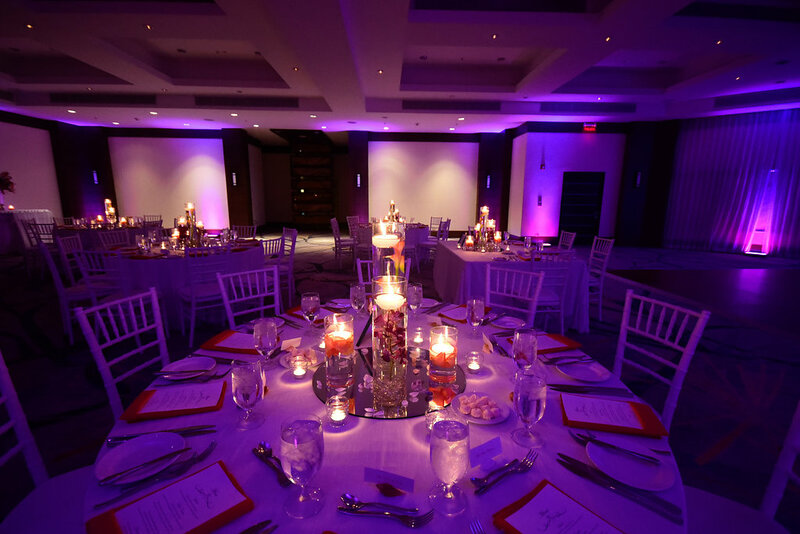 The Westin at Playa Conchal hosted the guests in grand style. Lia is absolutely stunning in a floral wreath. 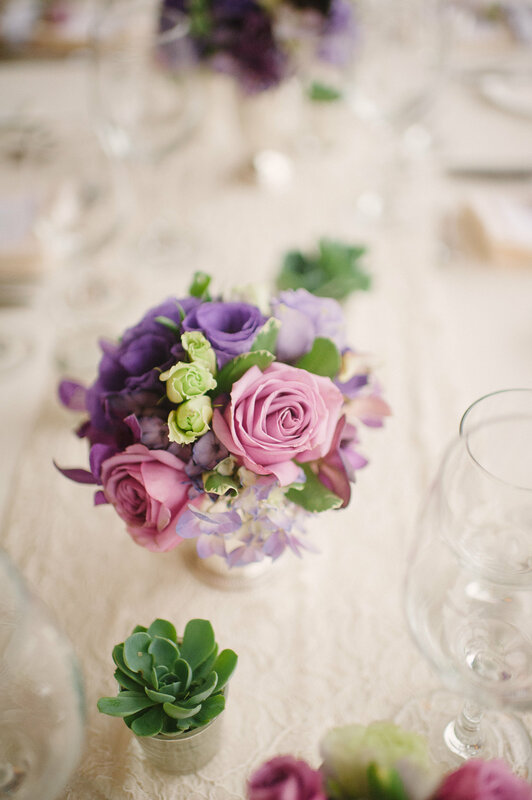 Using a palette of purples, lavender, white and greens, we created a lush setting with a vintage feel. 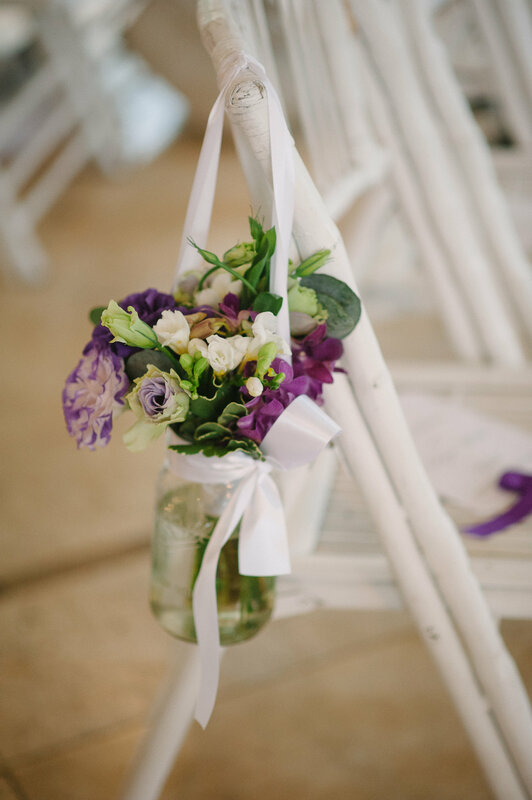 Mason jars houses cheerful bouquets of lisianthus, orchids and greenery as aisle markers. Although the day before had been sunny and hot, the rains started at noon on the wedding day and didn’t let up. 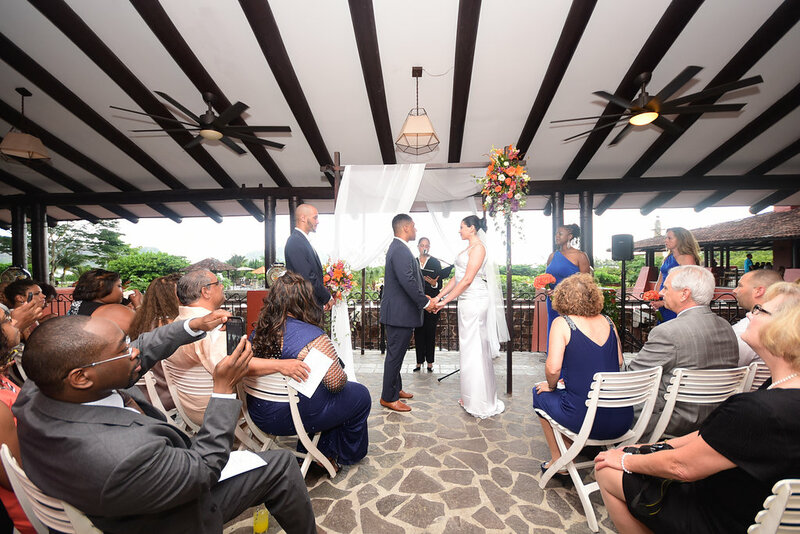 Being August, we’d planned for the possibility of the wet stuff and moved the ceremony to the covered restaurant area at the Reserva Conchal Beach Club where the reception was to be held. Persian ceremonies feature blocks of sugar being rubbed over the couple’s heads to wish them a life of sweetness together. A family bible of the brides alongside a Quaran of the groom’s family, family photos and traditional wedding items all decorated the sofreh. 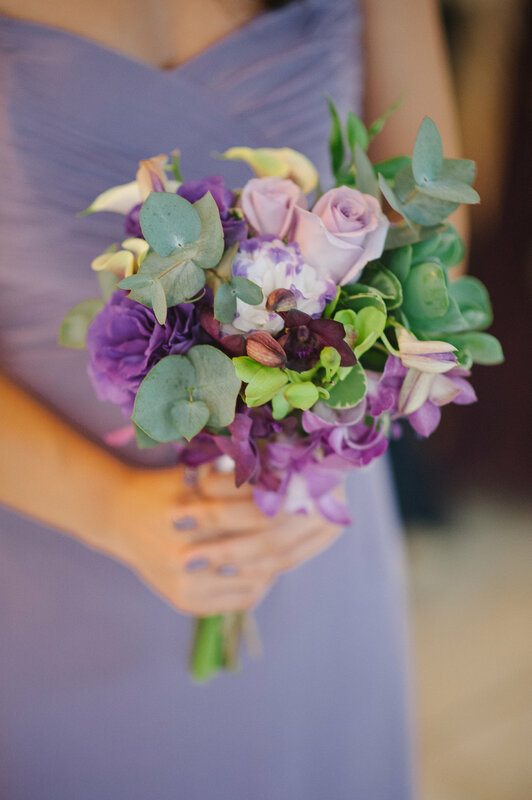 Purples and greens popped against the lavender of the bridesmaids’ dresses. The happy couple enjoys a moment at the sofreh. Tags with the couple’s initials prettied up the signature cocktails. Imperial tables were set with gorgeous Italian lace runners, a beautiful fabric find the bride had made at her work in the fashion industry. 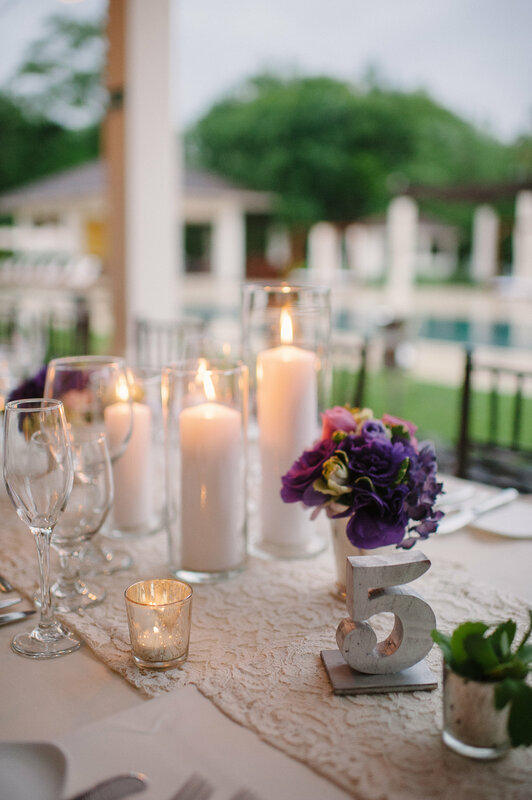 Silver julep cups mixed with mercury vases to create a romantic look. Succulents added texture and a contrasting shade of green to the table. 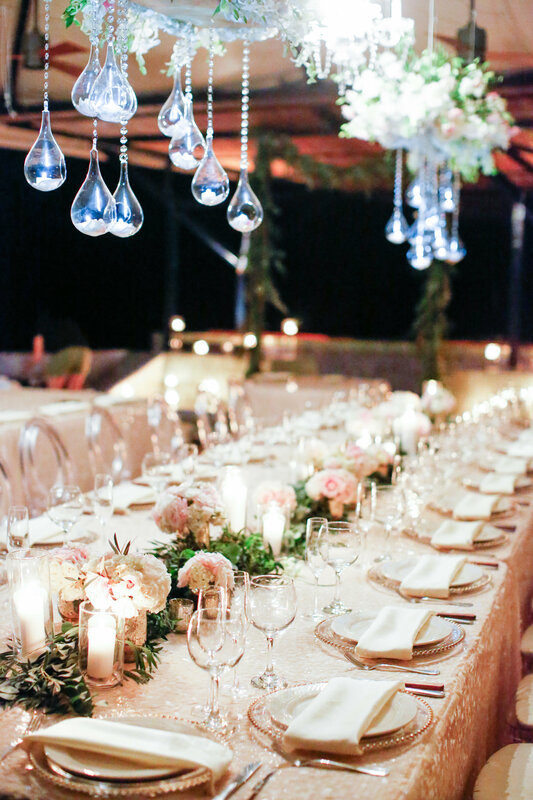 Lines of twinkle lights festooned with crystals bookended chandeliers suspended over the tables. Blackboards are an environmentally-friendly alternative to paper seating cards. 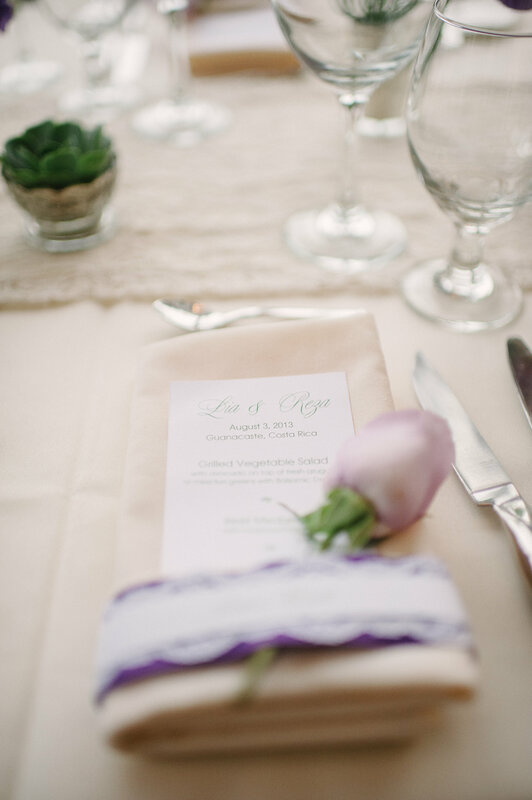 Ribbon with lace added an elegant touch to the napkins. Reserva Conchal Beach Club all lit up for the celebration. Such an incredible setting! 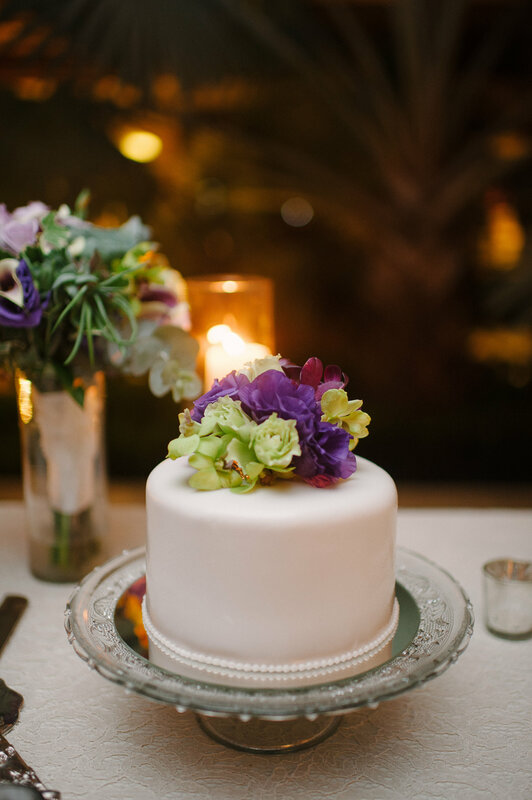 Simple white cake with a bouquet of flowers atop an antique glass cake stand. A day after-shoot with fun in the pool? Yes please! 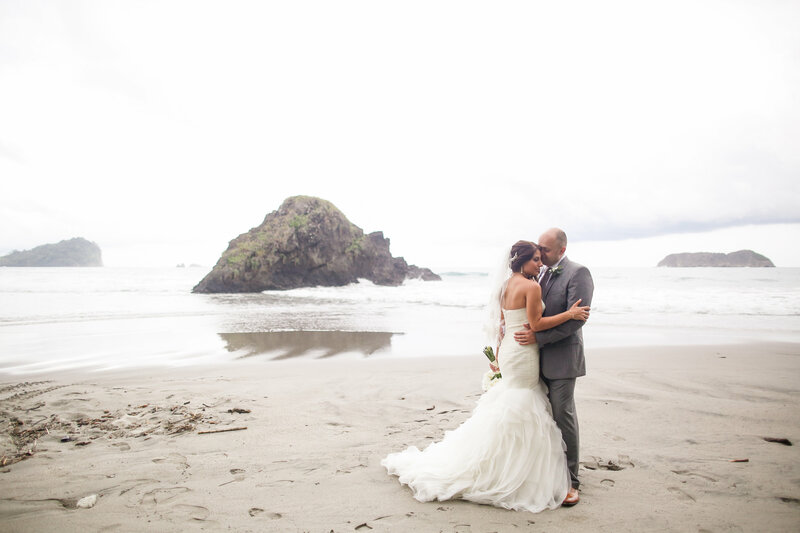 Playa Conchal is one of the most beautiful beaches in the country and is a stunning backdrop for any photo session. Love the inclusion of horses! 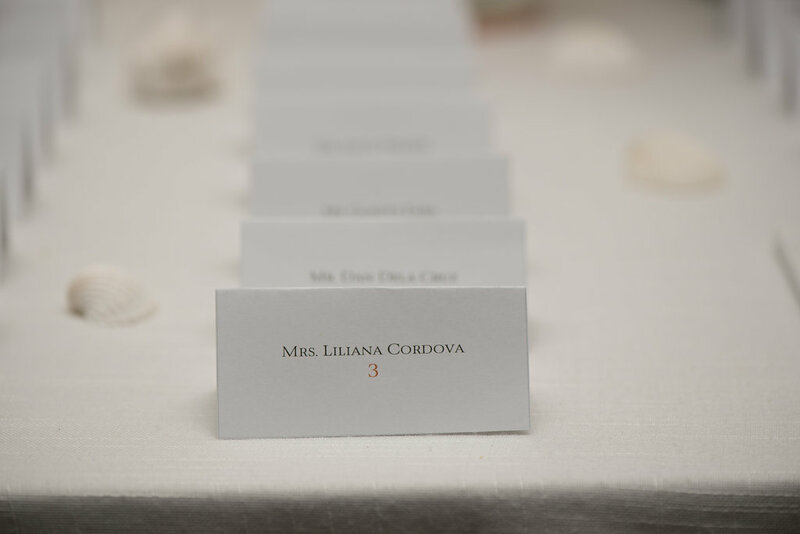 Big thanks to Comfort Studio for all the incredible photos and felicidades to Lia and Reza! 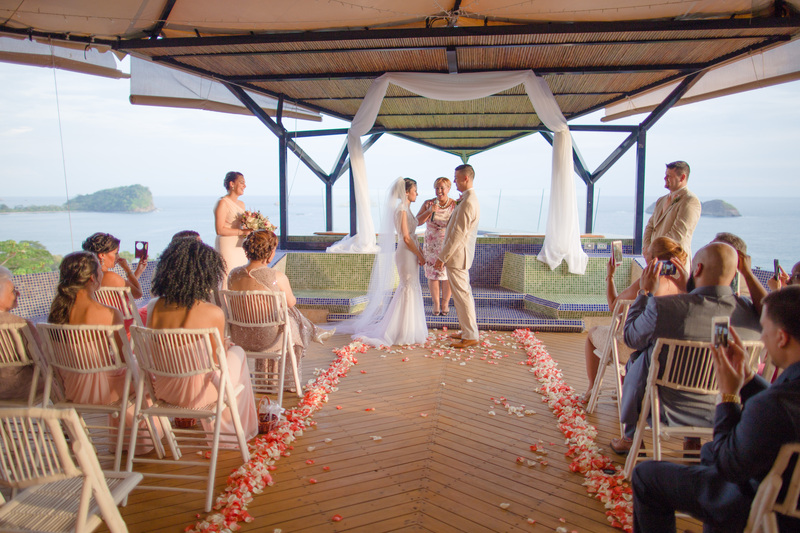 Weddings Costa Rica is pleased to announce our partnership with Promise Financial, the only consumer lending platform dedicated to weddings and honeymoons. 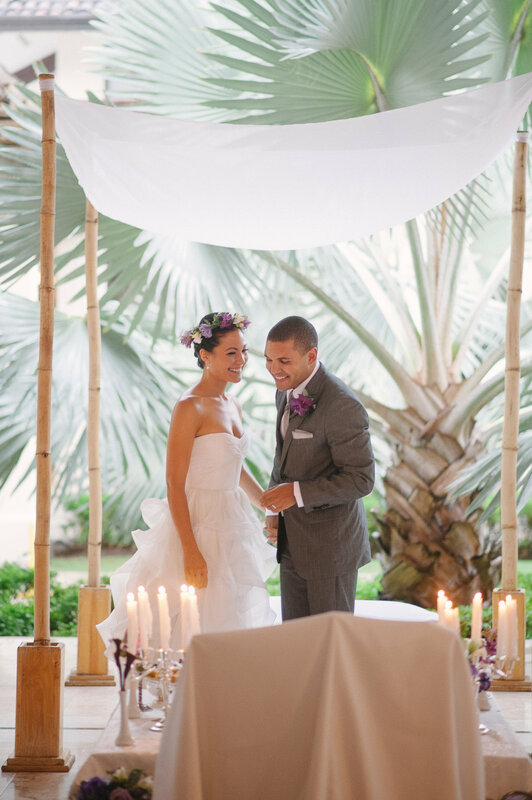 Paying for your dream wedding and honeymoon should be just as easy as planning it!